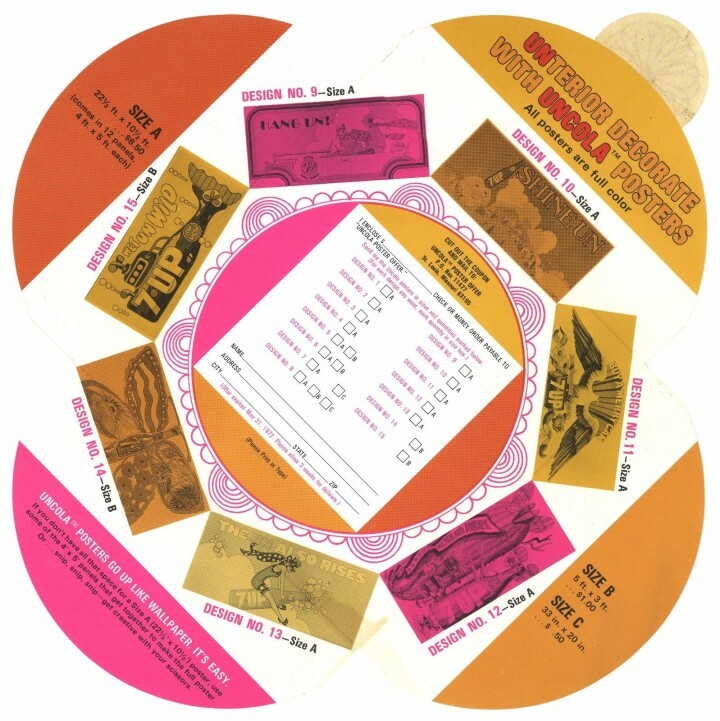 It’s that time again, for another Jon Brooks album to grace the turntable and record shelf/box/bag, returning under his The Advisory Circle guise to the consistently dependable Ghost Box label. 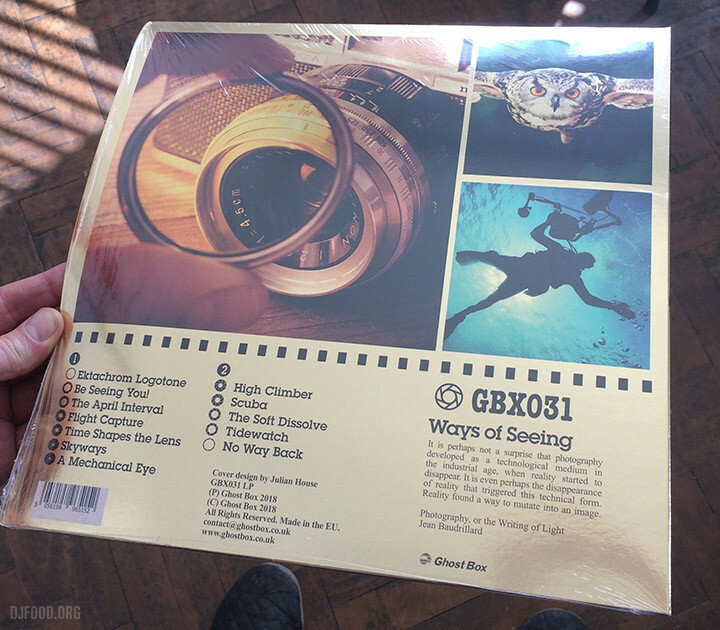 Wrapped, as always, in a gorgeous gold mirrorboard sleeve design by Julian House, Jon has conjured up another set of gorgeous melodies and lush scenarios loosely based around the theme of photography. 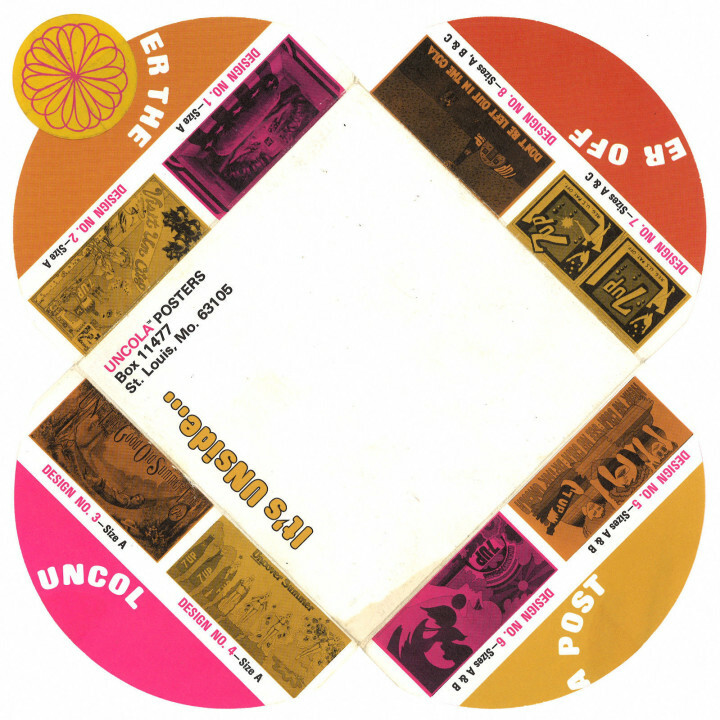 Gone are the uneasy undercurrents of his last outing for the label, ‘From Out Here’, and instead we get a summery set of beautiful library-like cues, never outstaying their welcome (some leaving too early) with a guest vocal from The Pattern Forms’ cohort, Ed MacFarlane on the final track. 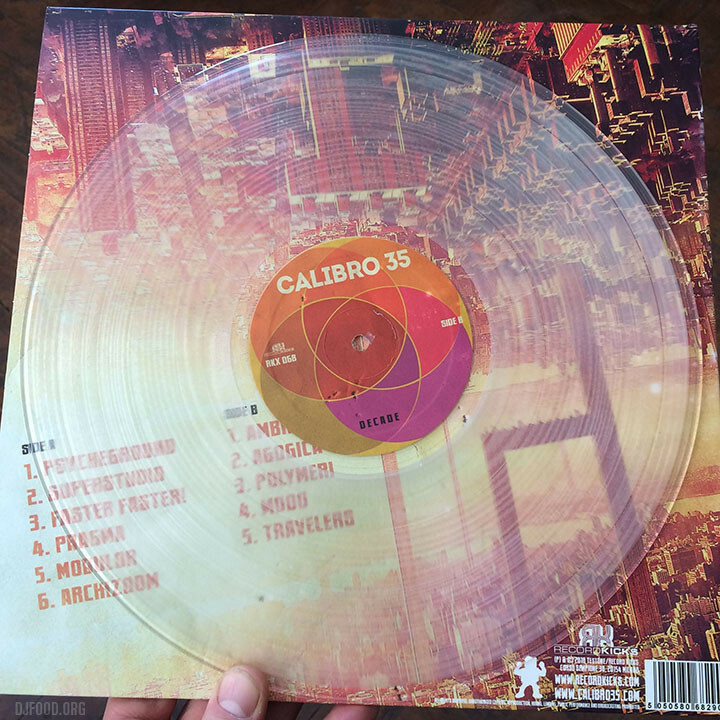 Pre orders just went live, get it here on LP, CD or DL. 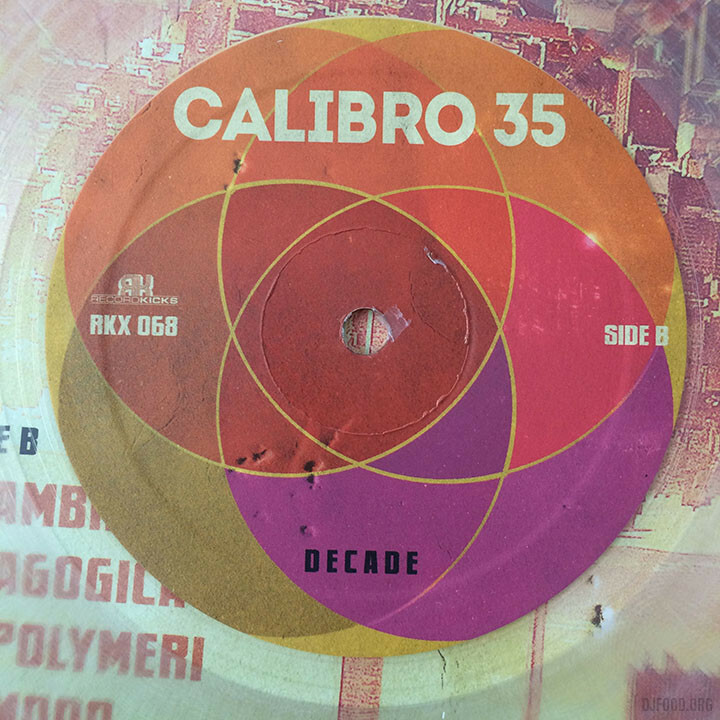 A mystery package of three 45s and 3 posters arrived a few weeks ago from Dutch label Haendehoch! 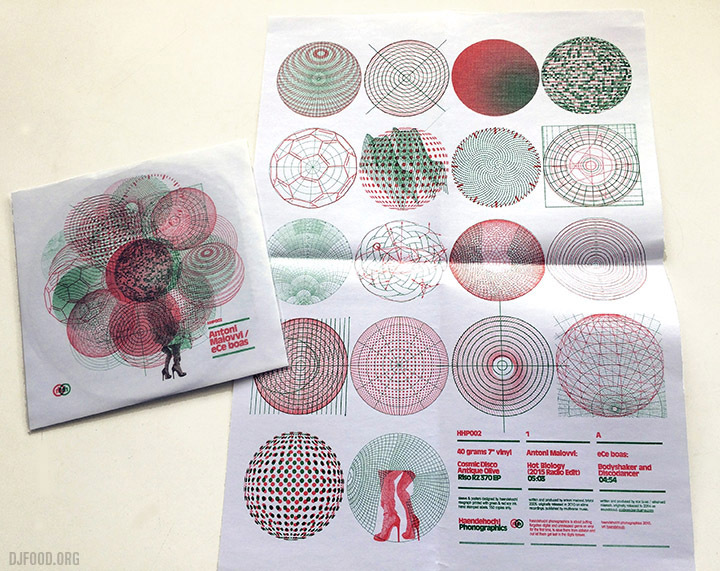 phonographics. 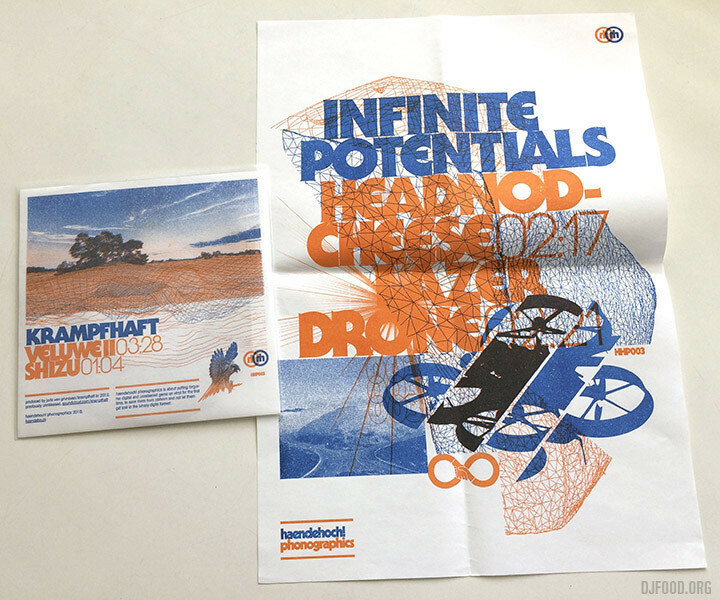 Each single is hand-stamped on the label, wrapped in a risograph printed sleeve, folded inside a plastic sleeve and comes with an A3 sized poster to compliment the release. 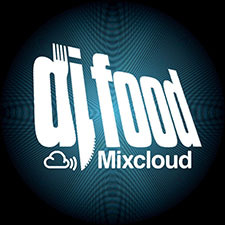 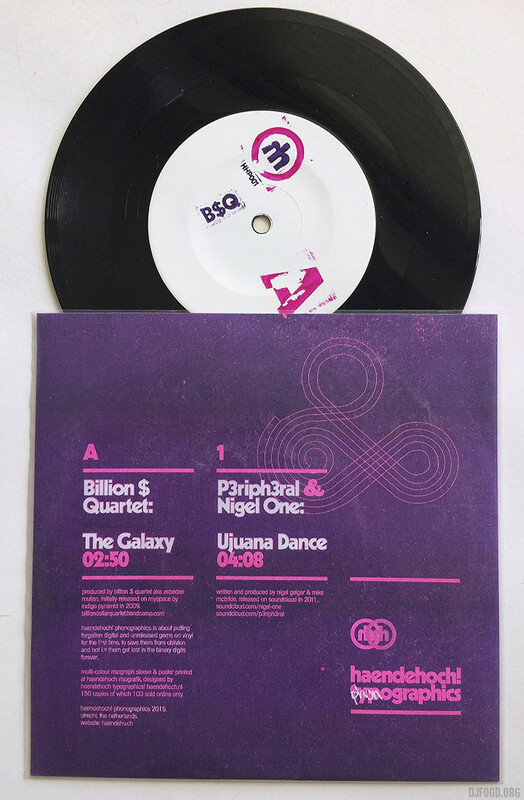 The idea for the label is to rescue music from the web that was never given a release on a physical format at the time and the first three releases glean their contents from Soundcloud files uploaded between 2011 and 2014. 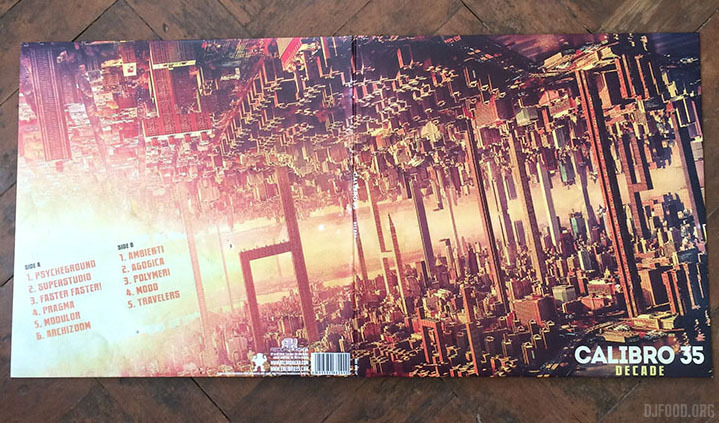 It’s a novel way to start a label and, whilst the music wasn’t really to my taste, the graphics are absolutely beautiful. 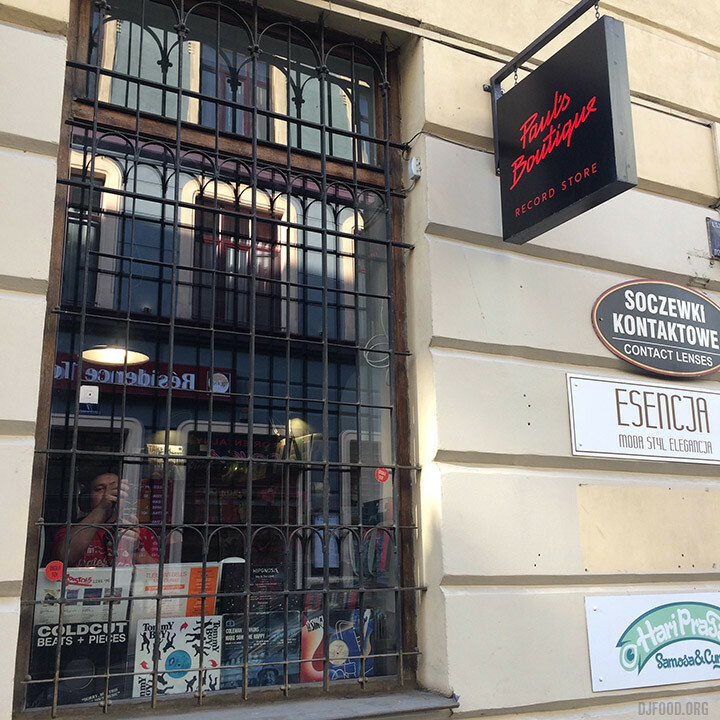 I spent Record Store Day in sunny Krakow, Poland this past weekend, playing an instore at the excellent Paul’s Boutique record shop and later spinning at Club Alchemia. 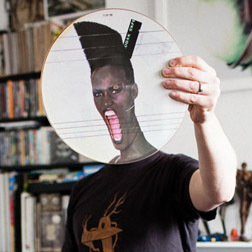 Whilst I was there I was graced with a pair of custom made 45 adaptors by new kid on the block, Sure Shot Tools. 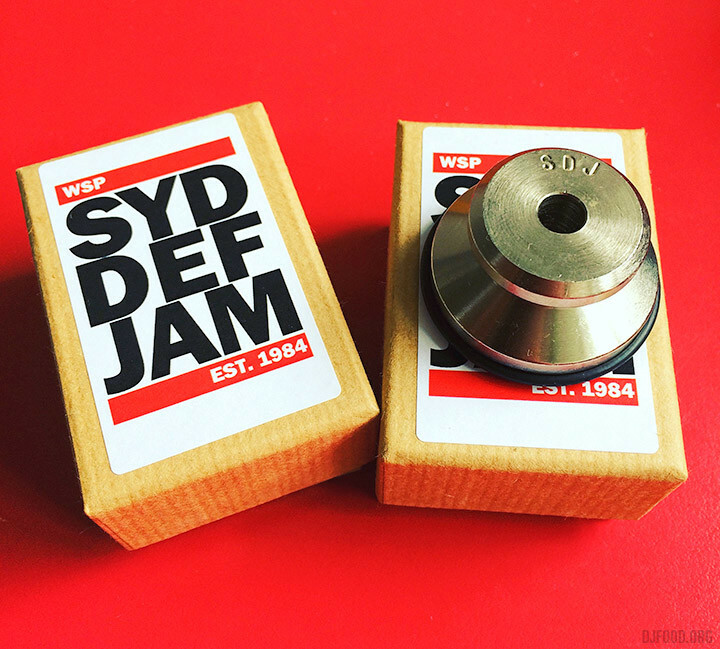 Having recently invested in a pair of the SydDefJam 7″ middles I’m pretty much set up for life as far as centers go as they do everything you’d ever need an adaptor to do. 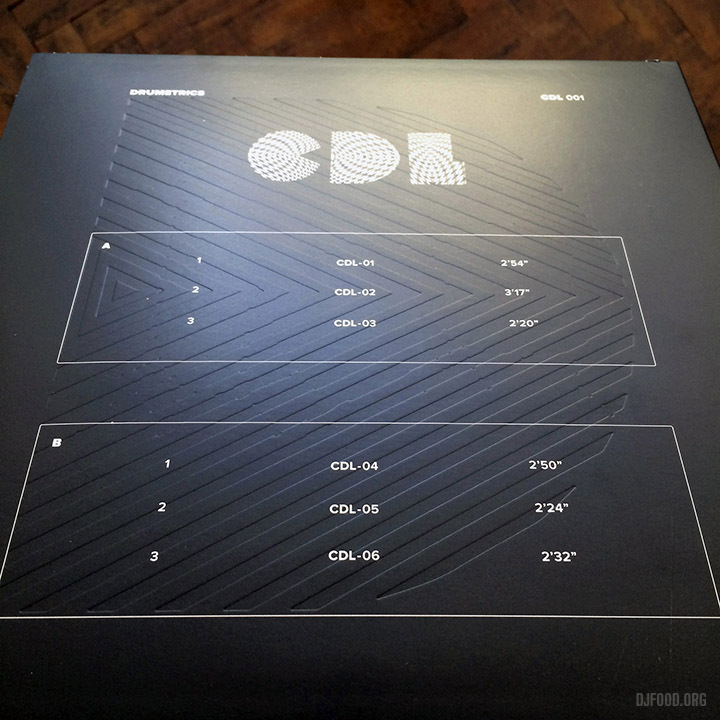 The difference here though, is the personalised machine-finished logo on the top, which sets them apart from the Australian leader of the pack. 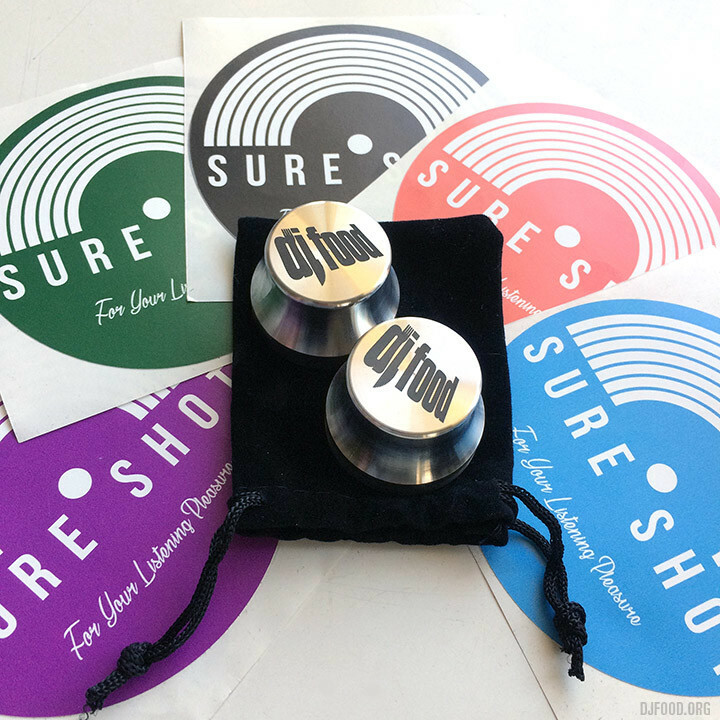 Syd offers hand-punched lettering but it’s rough and ready whereas Sure Shot can take a logo and engrave it perfectly onto the top of the middle for that professional finish. 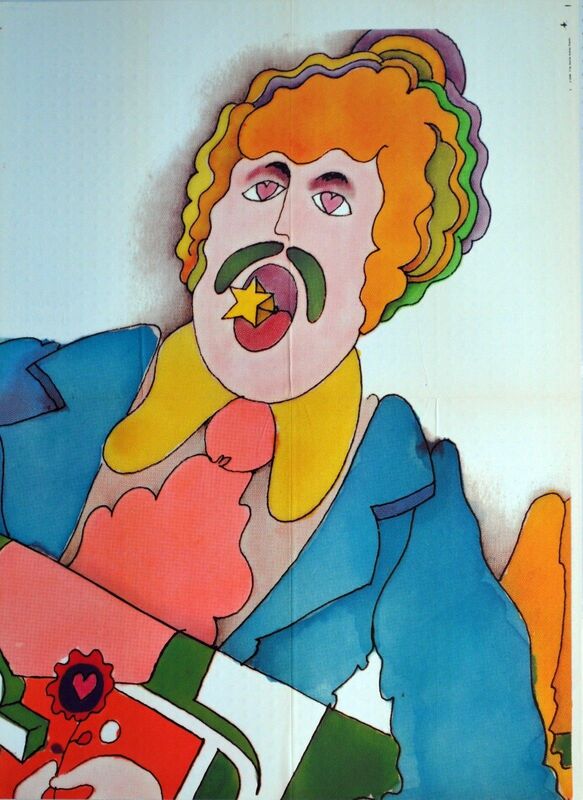 His centers are as heavyweight as Syd’s but lack the rubber ring that holds the records firmly in place. 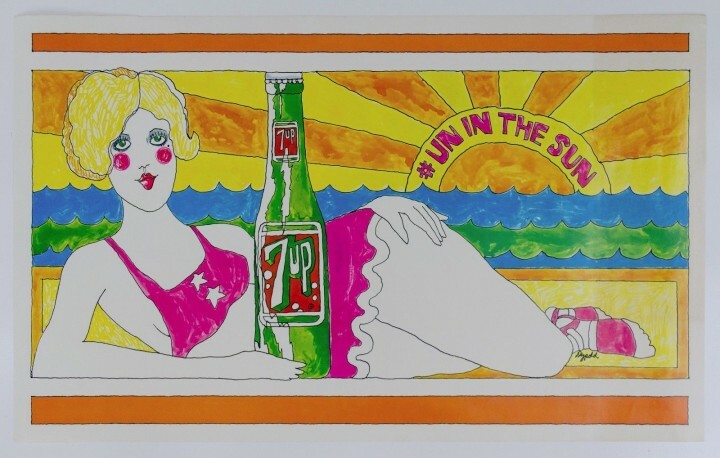 Another plus point for us Europeans is that the postage costs aren’t as prohibitive on the Sure Shot’s than on Syd’s but really it’s down to individual taste in the end, they both do the job admirably and look great into the bargain. By the 70s, things had started to change graphic-wise in publications and we go into what I call the ‘statement’ era of advertising where text played a big part in hooking the viewer in via an intriguing ‘headline’ and then selling the product in a quirky sales-pitch style similar to these examples below. 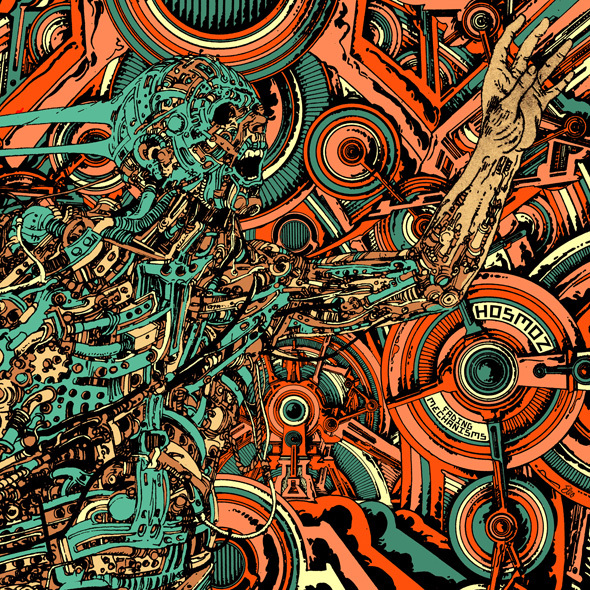 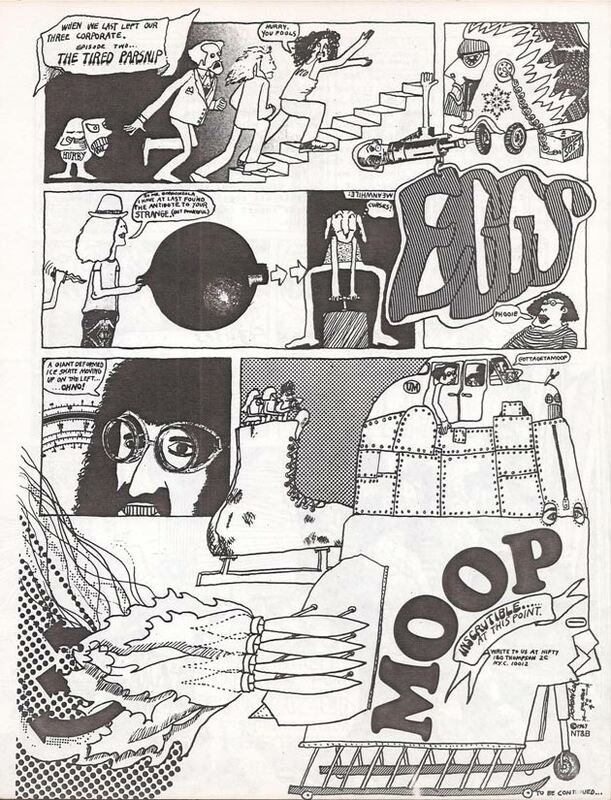 Crazy graphics, surrealism and excessive detail were out and, as a designer, I can’t blame them. 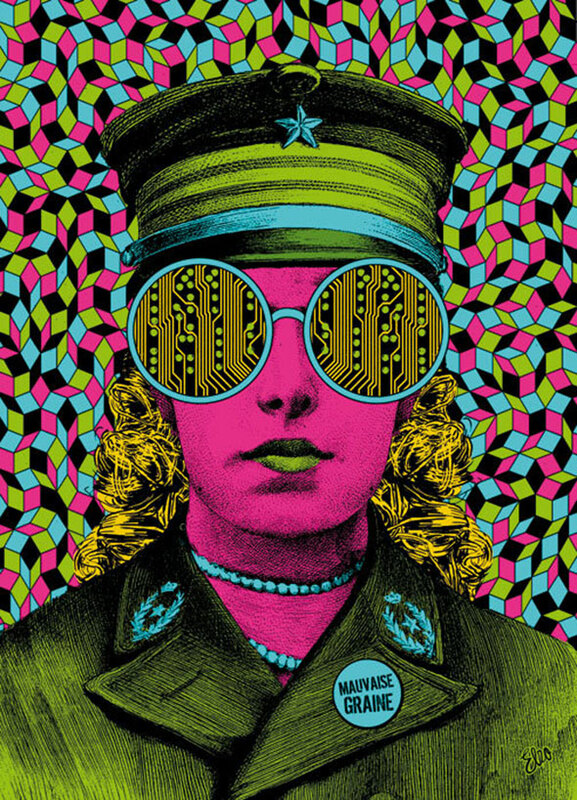 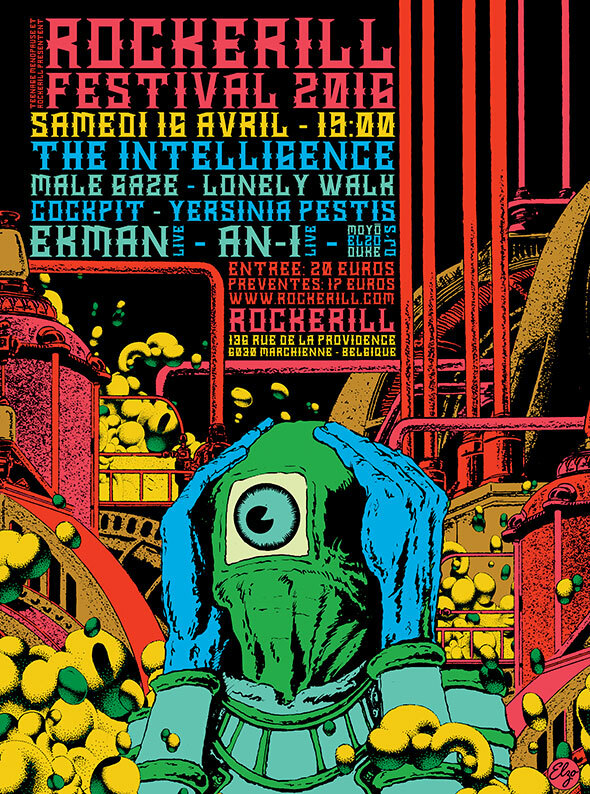 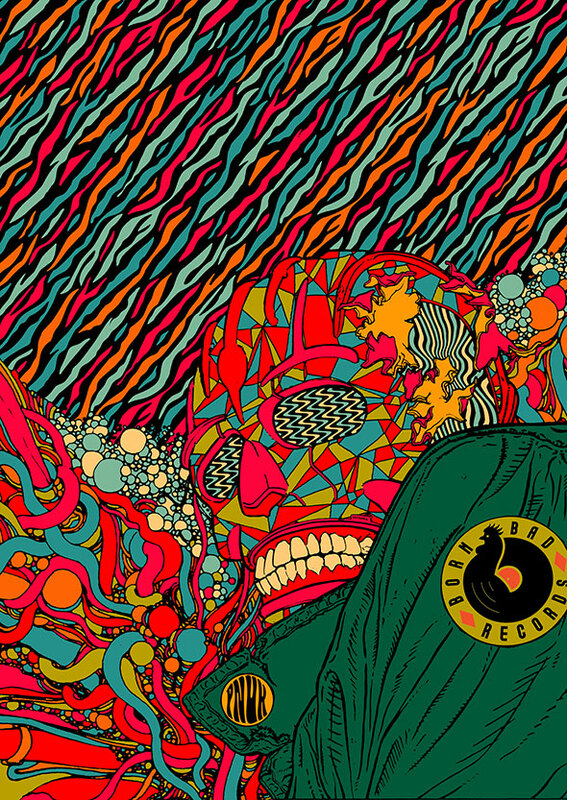 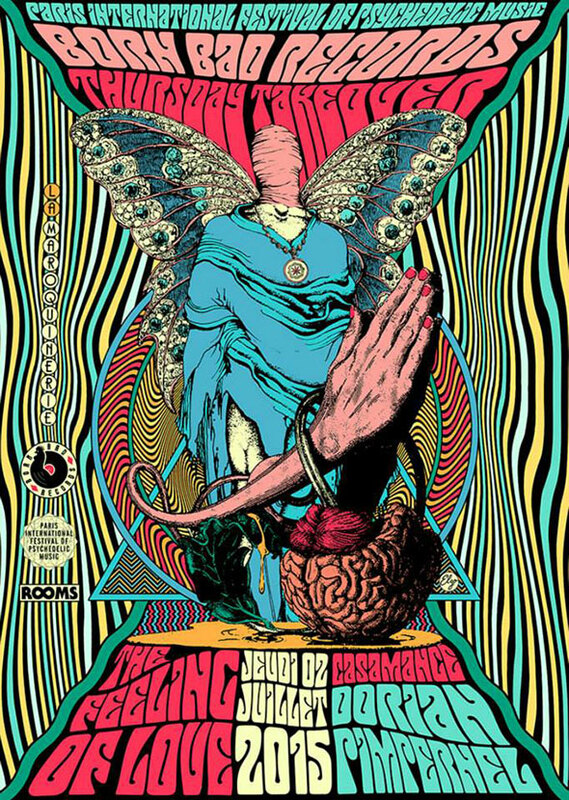 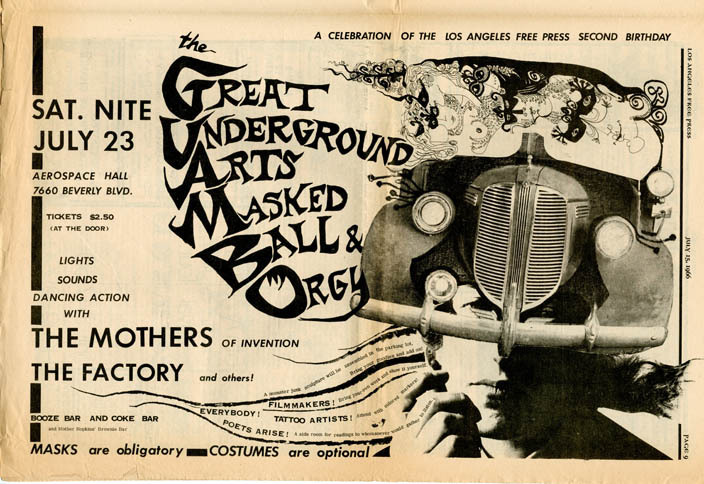 Much the same as the sometimes impenetrable psychedelic posters of the late 60s were only meant for the heads in the know to decipher, their time was up and now the marketing men had to sell this stuff to the masses rather than keep it underground. 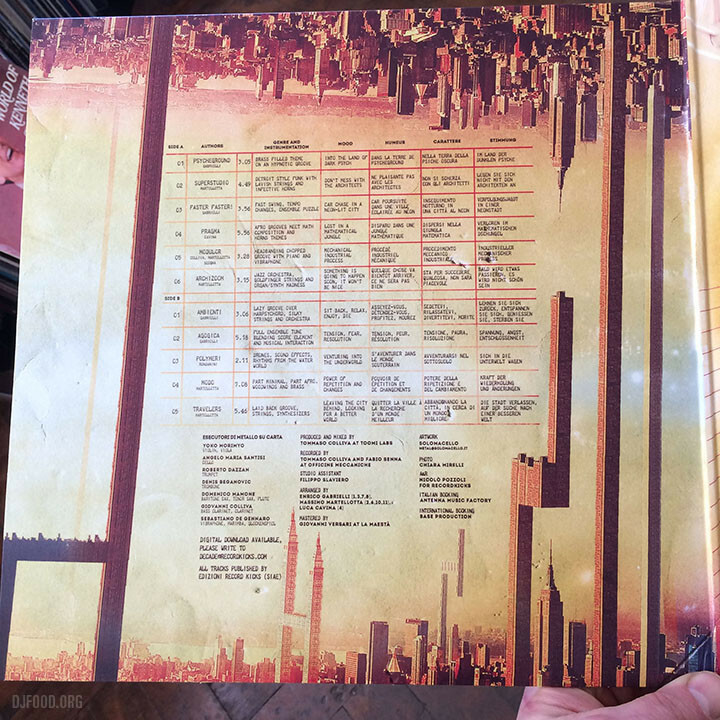 Cue straight, no-nonsense text in blank space and packshots of the album or group in question. 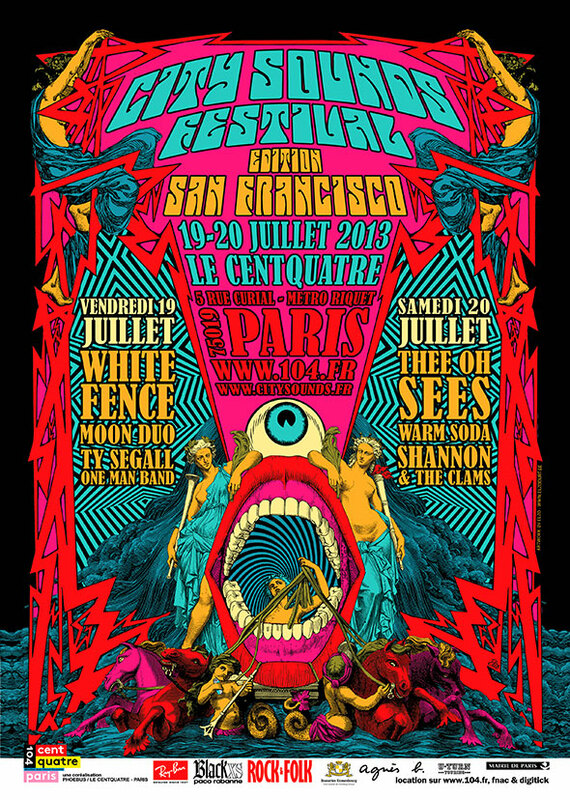 SPLICE 2018 /// FESTIVAL TRAILER /// from Splice Festival on Vimeo. 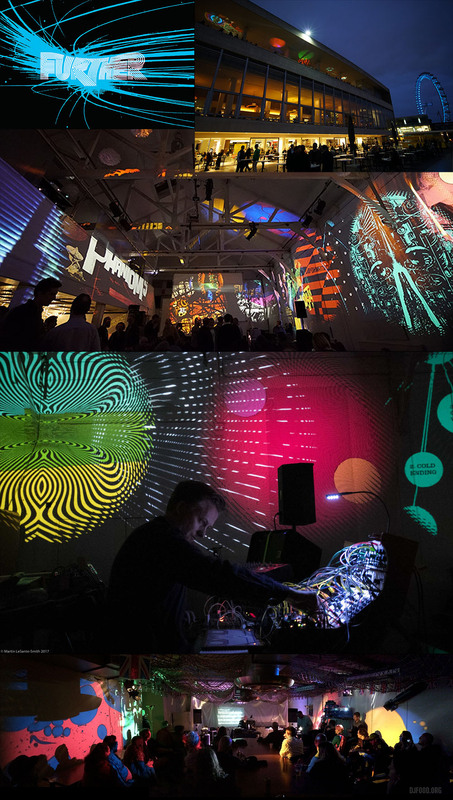 An incredible line-up of AV performances to explore, workshops to participate in, films and talks to expand your knowledge, Splice Festival 2018 is back for a third time. 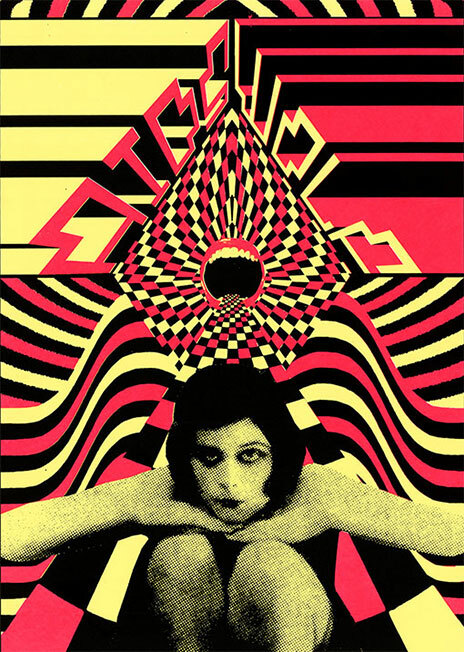 There’s an additional venue on Sunday at Stour Space which looks just as good with Howlround reprising their live soundtrack to ‘A Creak In Time’ from last year’s premiere at Further plus Mixmaster Morris DJing, and some amazing – looking film from iloobia and Graham Dunning‘s mechanical techno project. 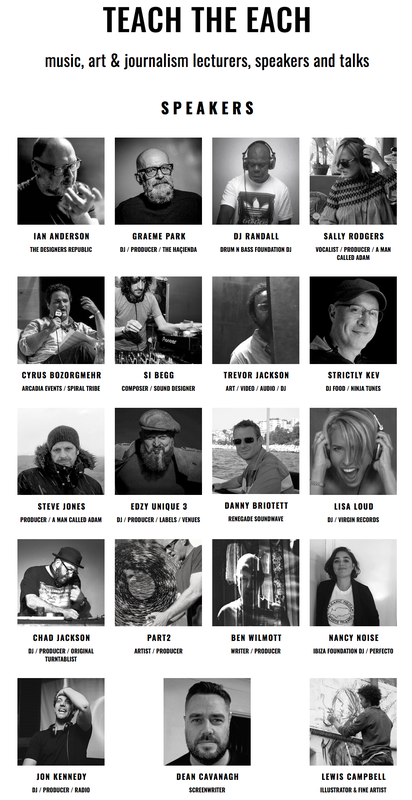 They have limited space available for the very popular workshops so get ’em now to avoid being disappointed. 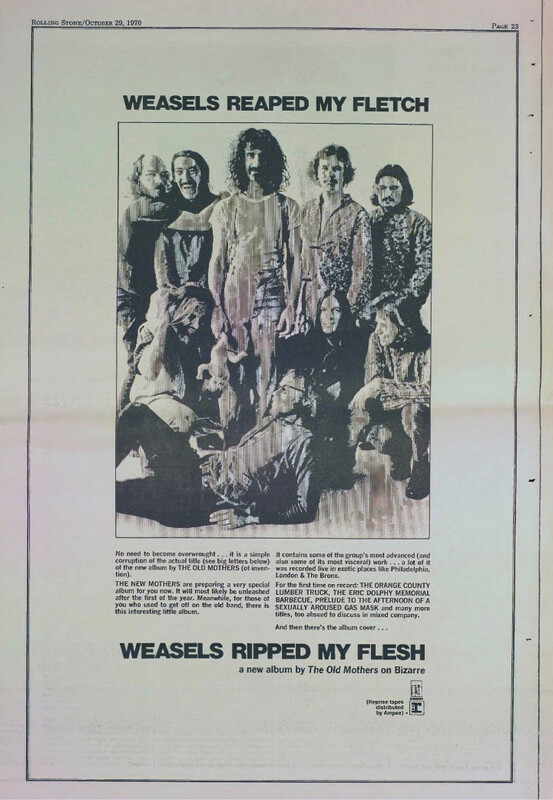 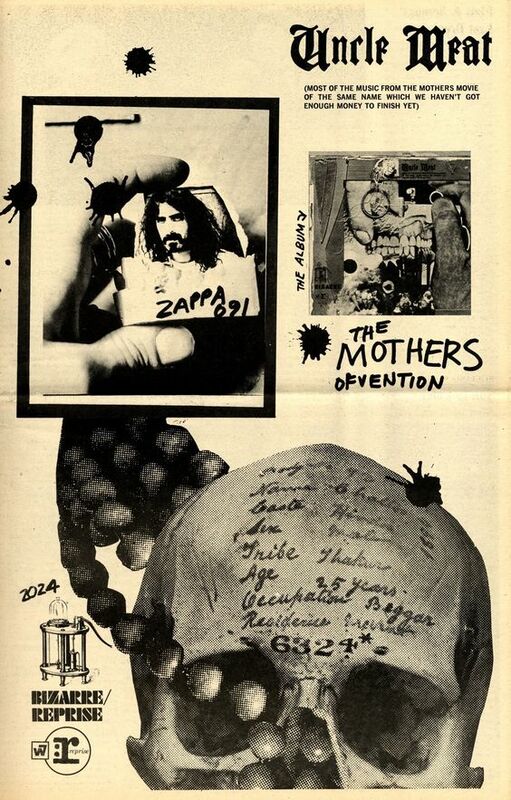 Lately I’ve been studying the collage art of Frank Zappa and Cal Schenkel from the Mothers of Invention albums. 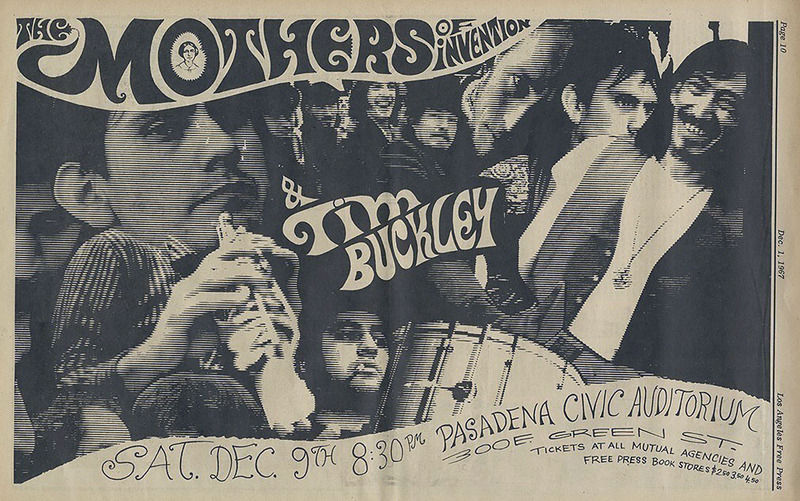 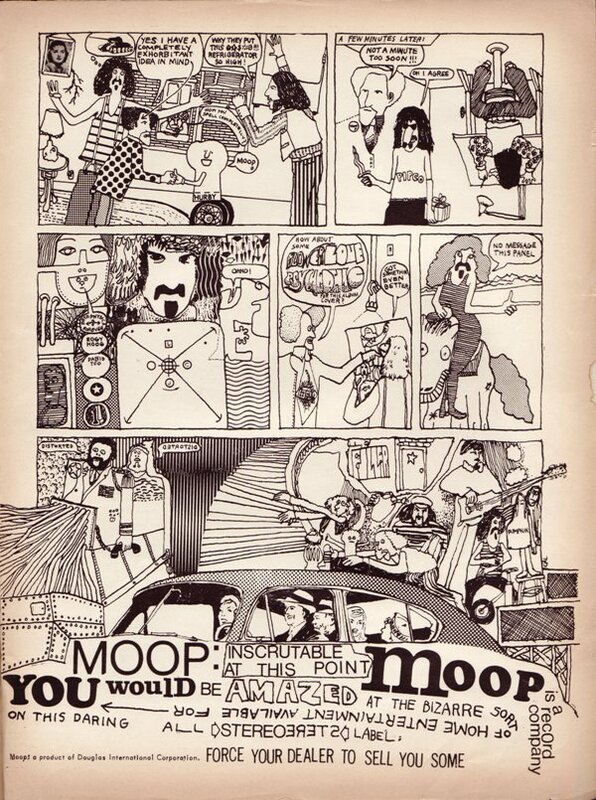 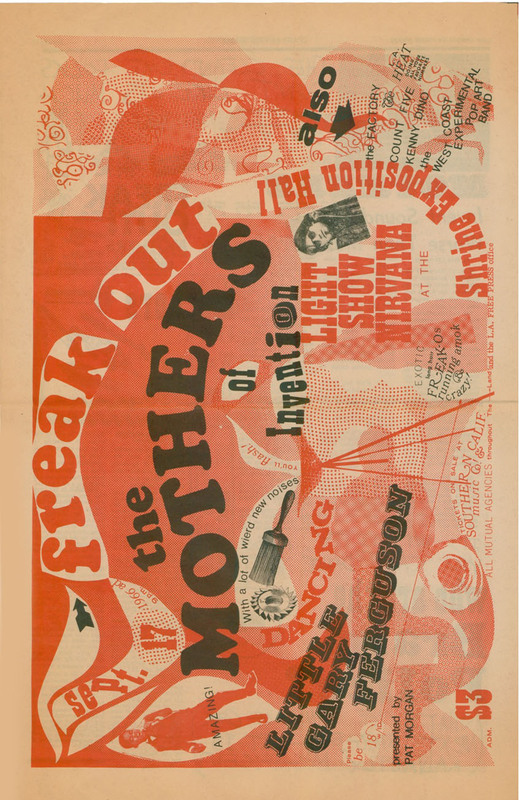 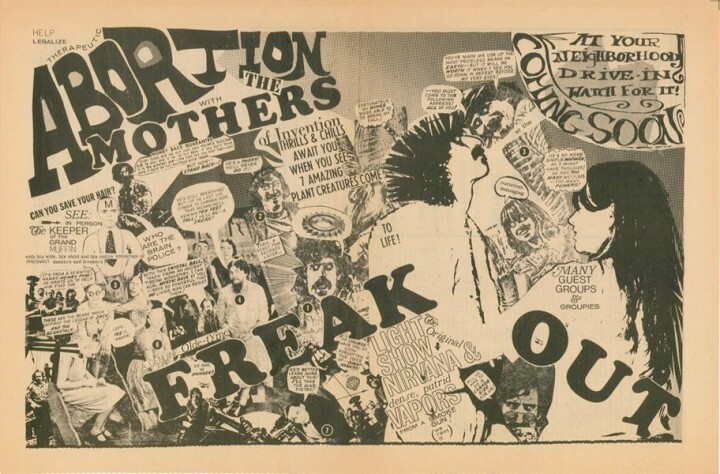 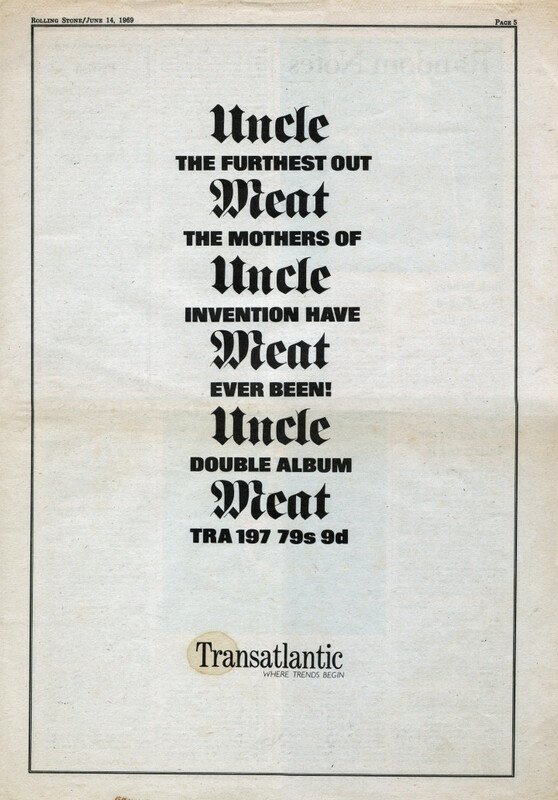 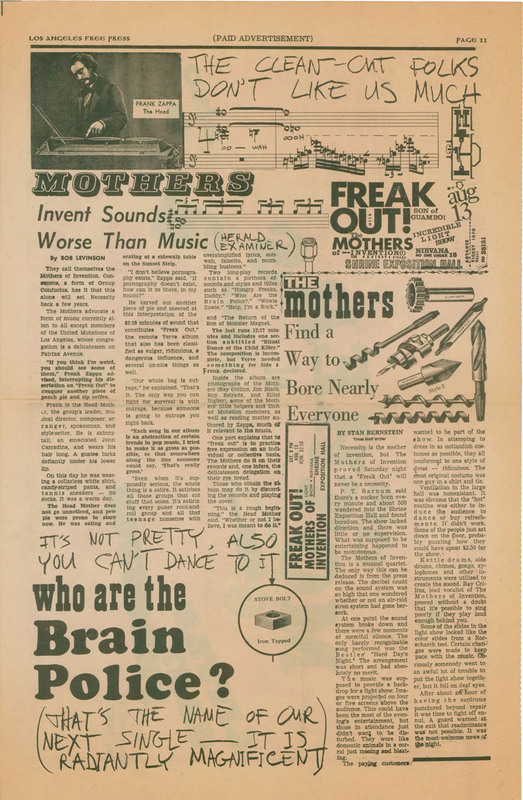 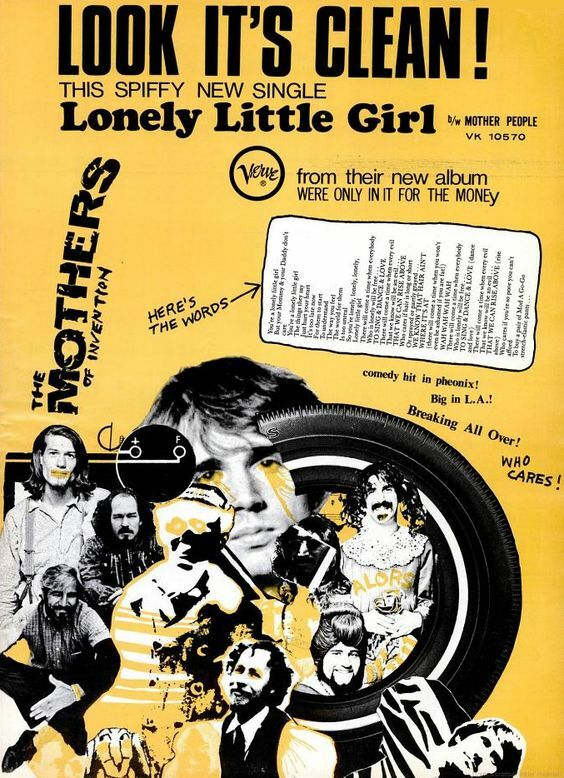 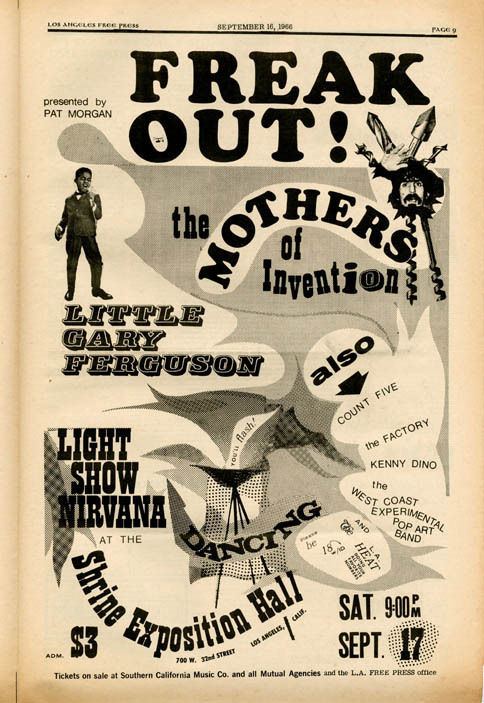 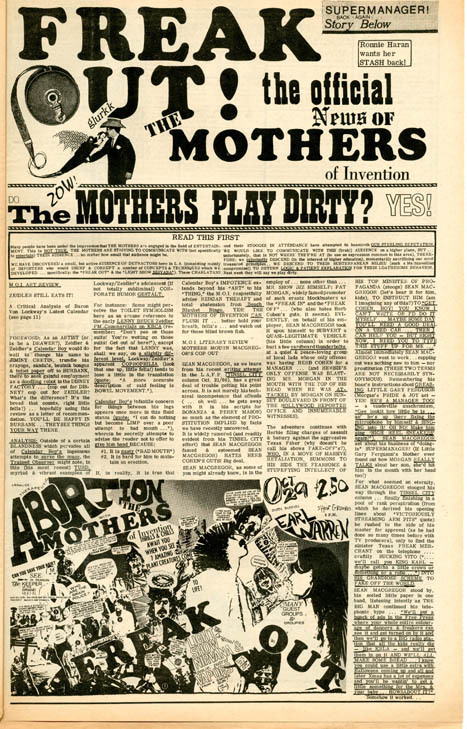 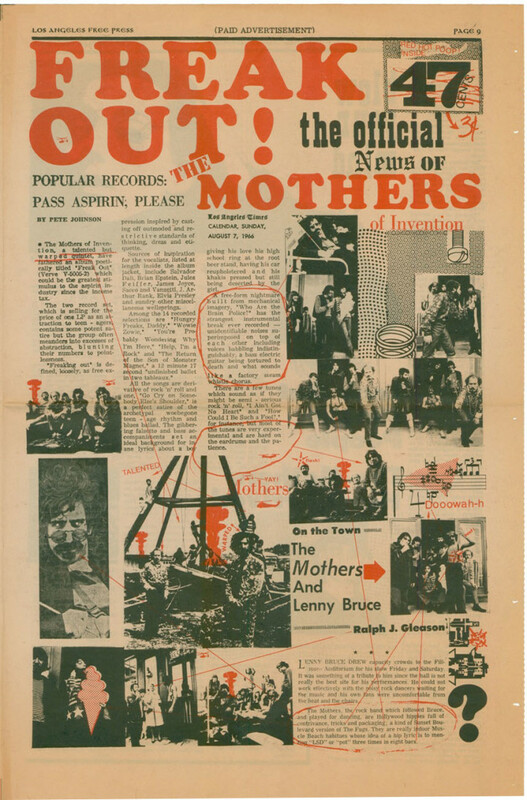 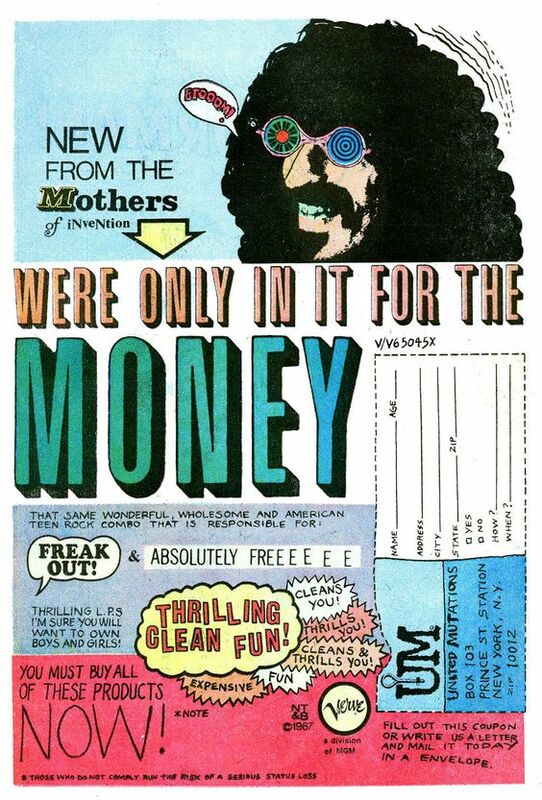 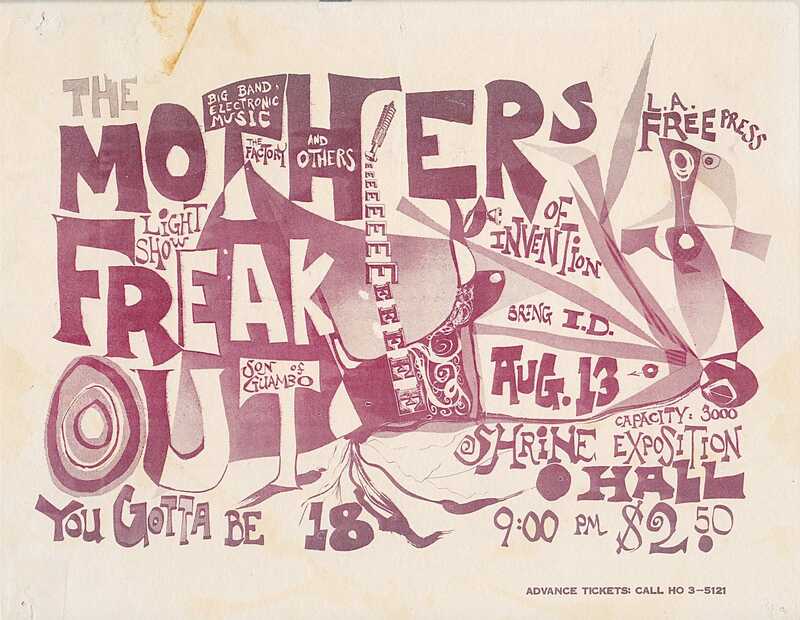 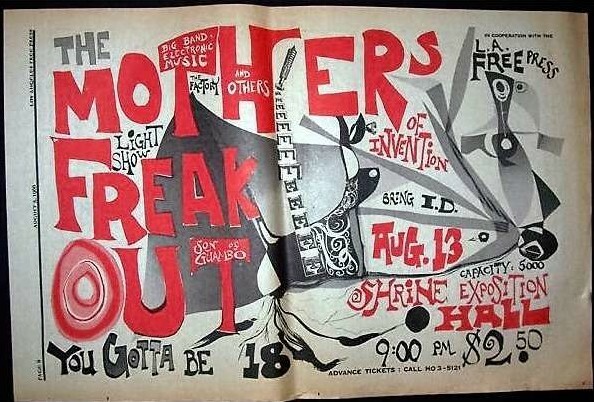 On reading up on this material, including a long interview with Schenkel, I realised that Zappa himself seems to have done a lot of the artwork for the first two Mothers albums, ‘Freak Out’ and ‘Absolutely Free’, with Cal coming in at the end of the latter and doing some of the adverts. 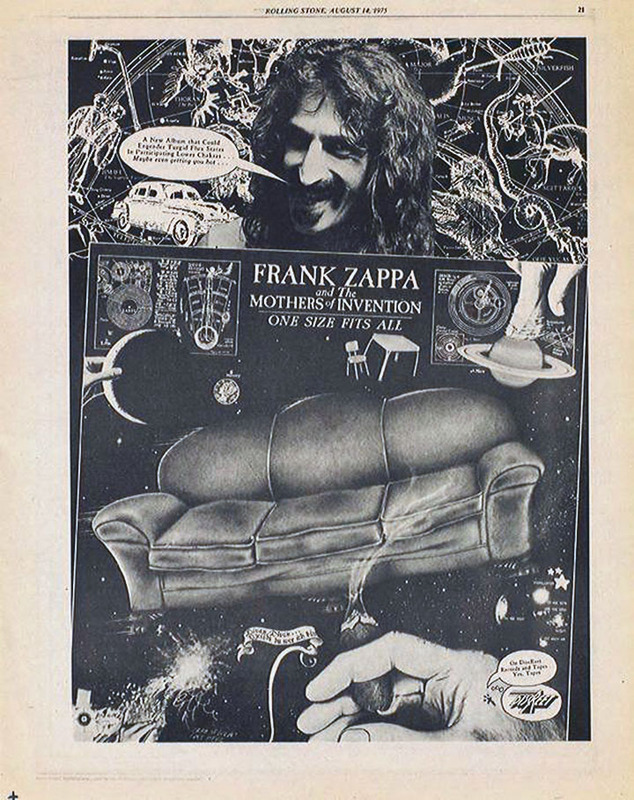 What you see below is – as far as I can tell – is mostly the work of Zappa who was a pretty decent visual artist in his own right is seems. 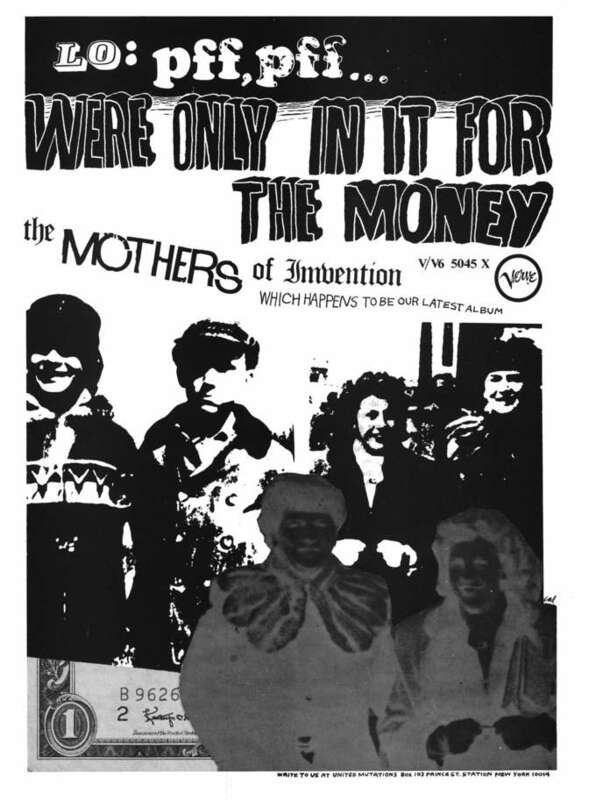 An ‘official New of the Mothers’ would occasionally get printed in the LA Free Press, below is the first one, a four page digest that includes a poster for a forthcoming gig. 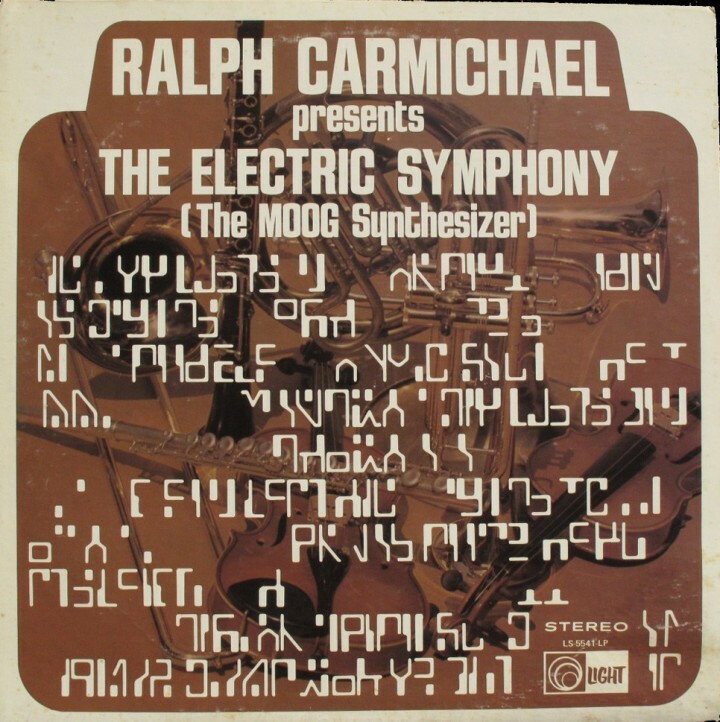 A lovely cover made me investigate further – it’s a religious Moog record and not half bad, but that sleeve! 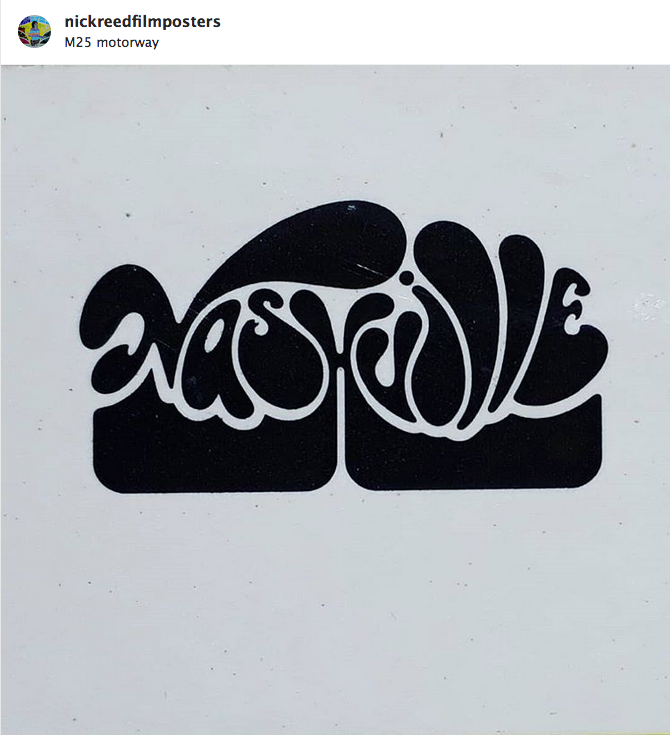 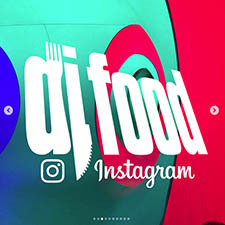 I spotted this beautiful design on Nick Reed’s Instagram. Nick sells a fantastic selection of original film and music posters and you can find him at many vintage fairs with a stall that stands out a mile. 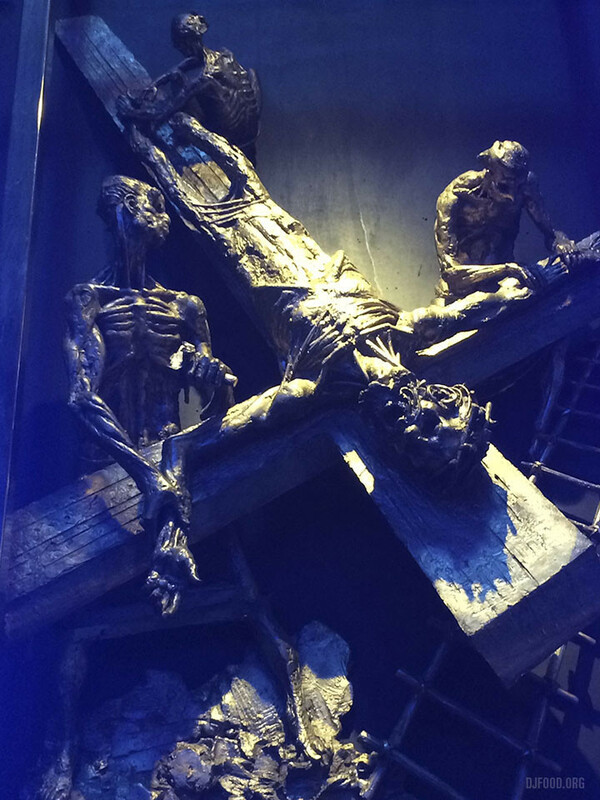 He’s also at Spitalfields market in London most Thursdays. 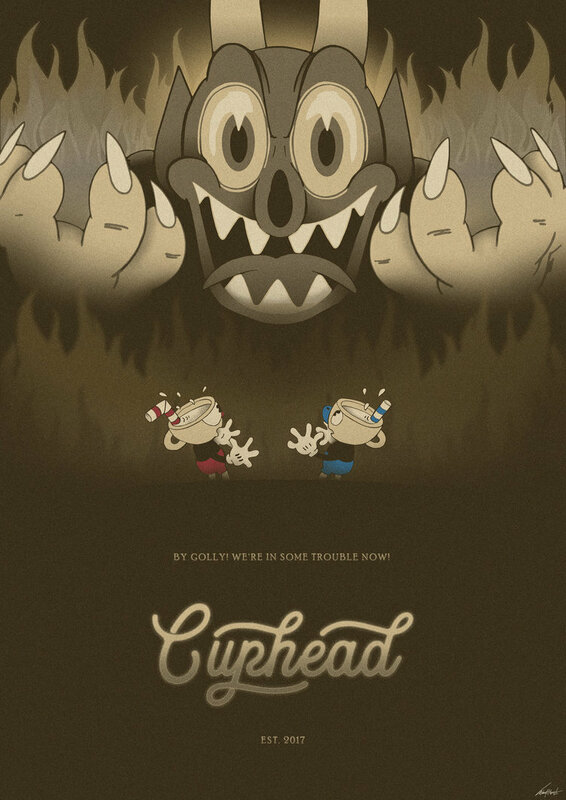 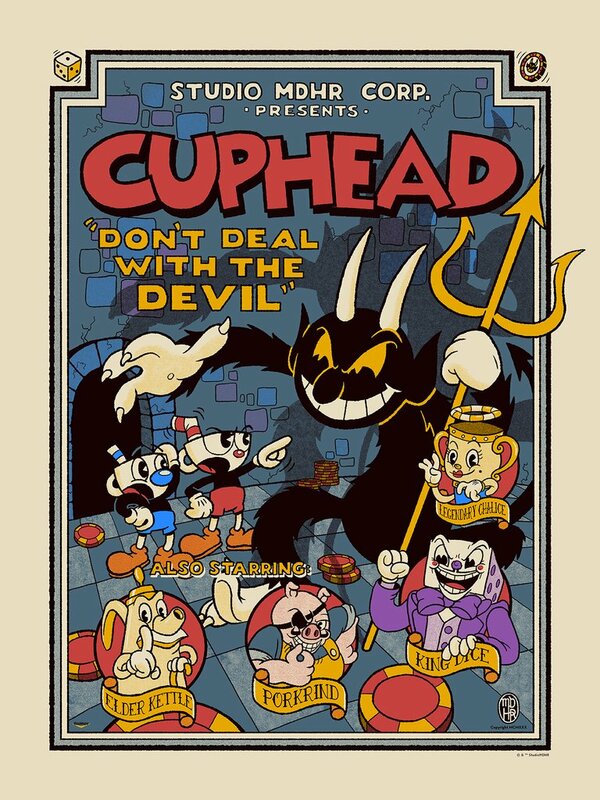 I’m still loving the design of Cuphead, the recent release from Studio MDHR based on the look of the old Fleischer Brothers animation studios. 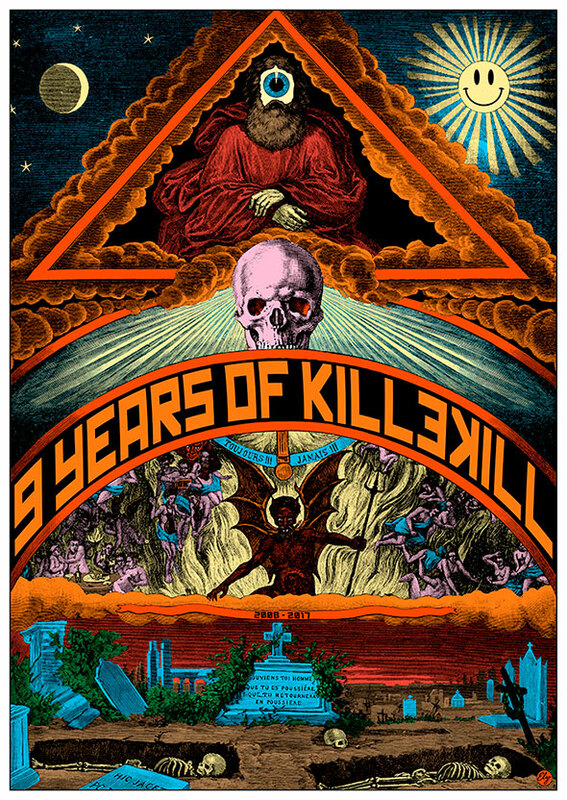 There seem to be lots of great posters for it online, possibly official, it’s hard to tell these days. Many follow the multi-coloured, multi-character model but some keep in line with the look of the game. 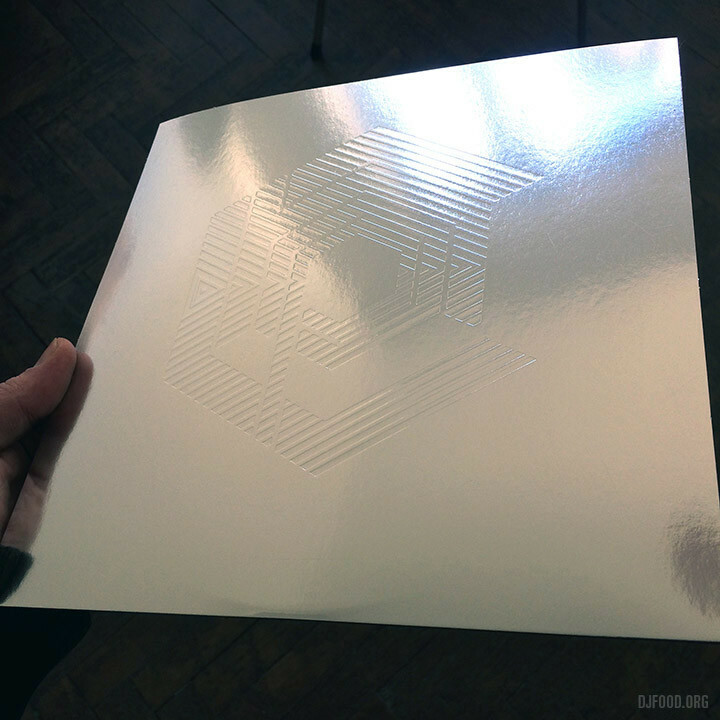 There’s also merchandise starting to appear, from enamel pin badges to the inevitable Funko toys but the best object so far has to be the 4xLP original soundtrack. 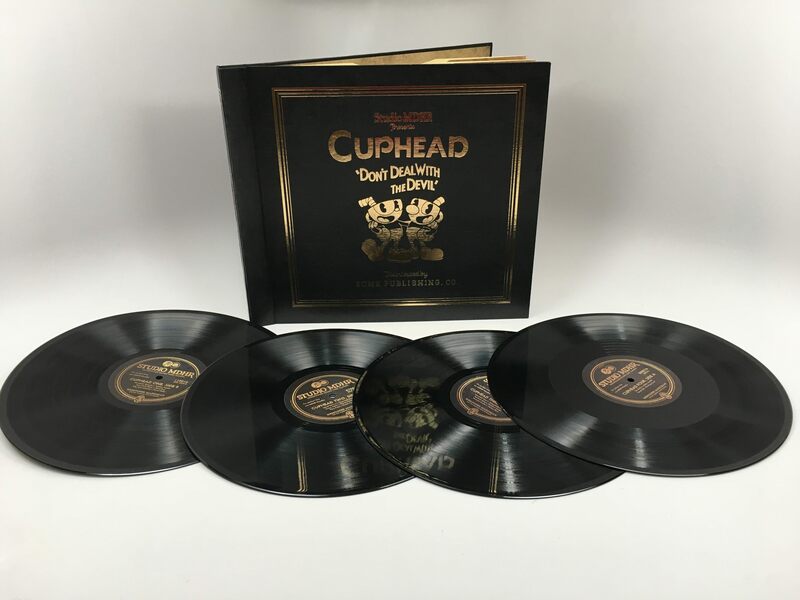 Housed in a 30’s book-style sleeve with gold leaf cover graphics, separate leaves for each disc and yellowed ‘pages’, it looks like it could have come straight from your grandparents’ vinyl collection. 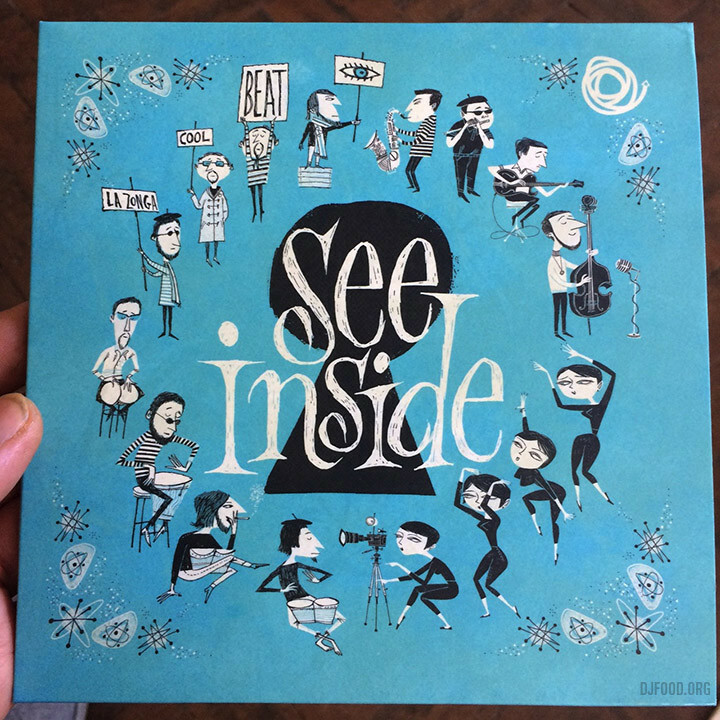 There’s also a lovely 7″ with selections from the near 3 hr LP set. 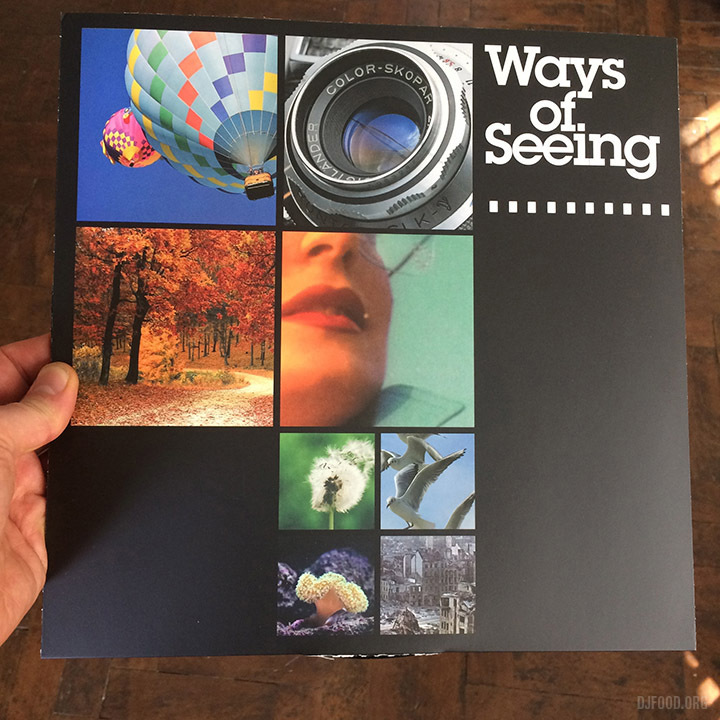 At an eye-watering £71 + postage it’s a bit out of my league at the moment but it looks worth every penny from the photos. 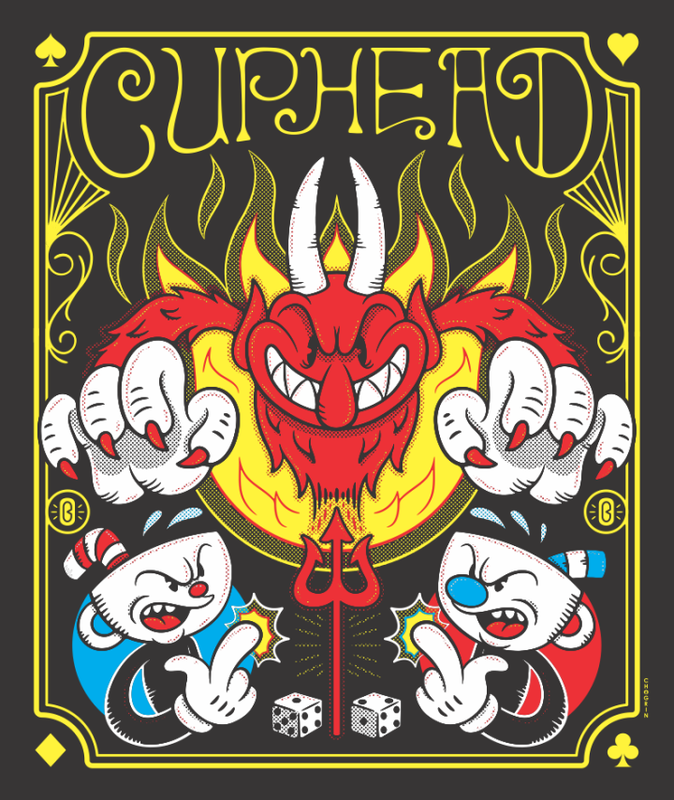 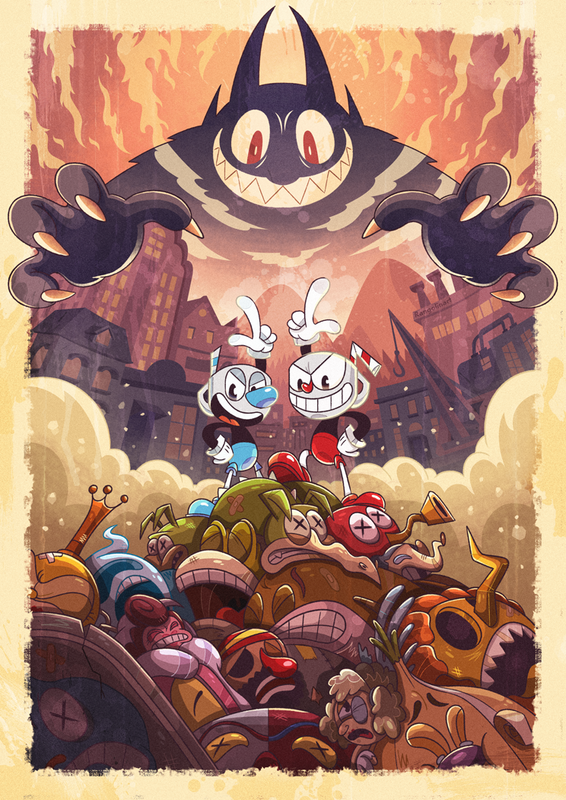 * Beware of pre-orders of figures from PopInABox – my Cuphead and Mugman figures are now 2 months overdue, one has been dispatched from overseas without a tracking number and the other remains in limbo while they wait for stock, meanwhile I’ve seen them in shops in the UK. 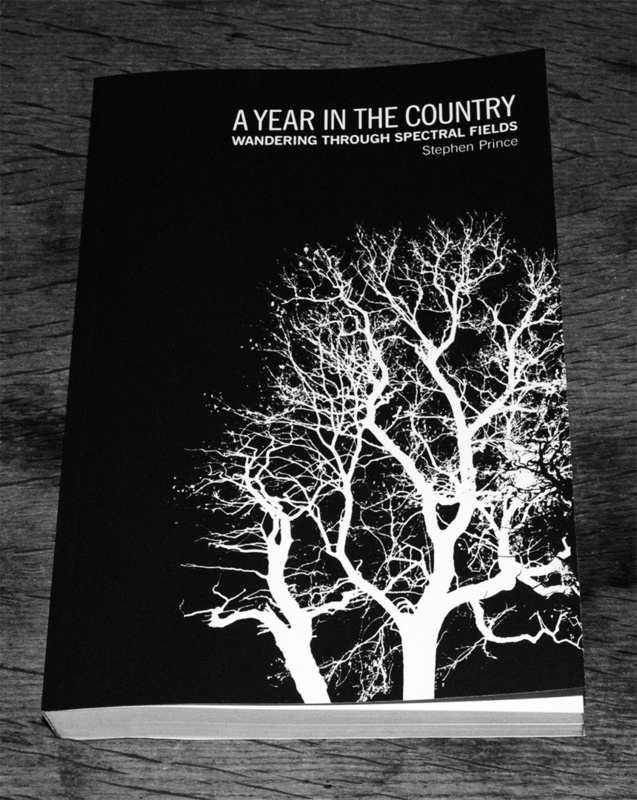 A Year In The Country, Stephen Prince‘s website dedicated to cataloguing, compiling and unearthing all things Hauntological, Radiophonic, Wyrd and uniquely British, is releasing a book of writings from the first three years of it’s output. 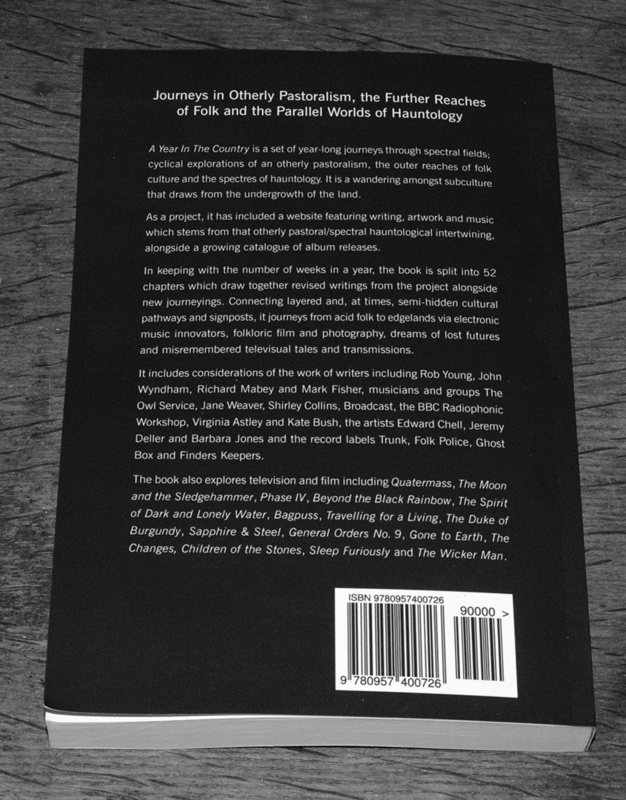 Collected, revised and revisited, alongside some new writing, ‘Wandering Through Spectral Fields’ – subtitled ‘Journeys in Otherly Pastoralism, The Further Reaches of Folk and the Parallel World of Hauntology’ is now available to read as an e-Book via Am*z*n (if you must) or for pre-order for a print release on April 10th. 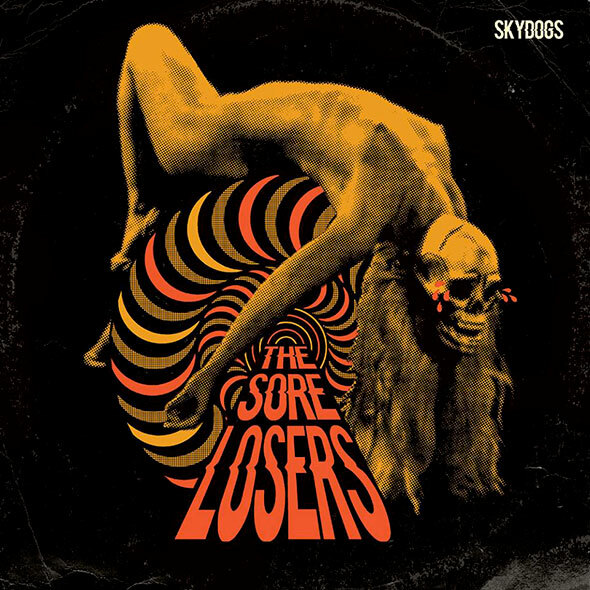 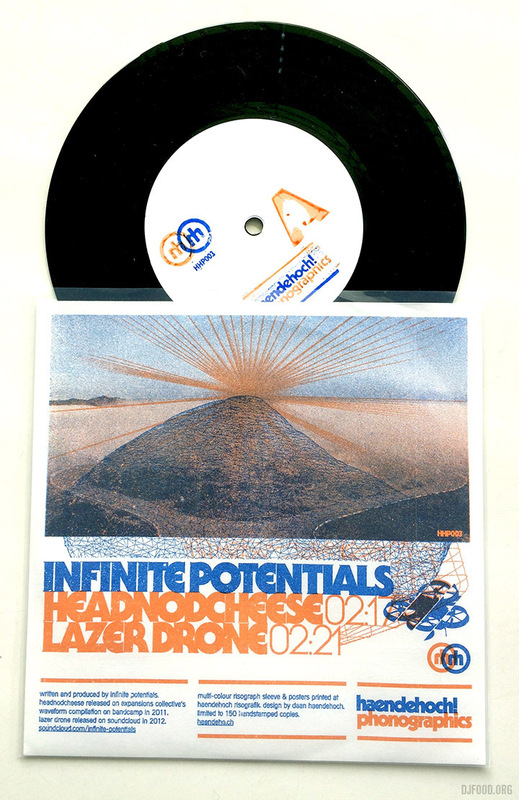 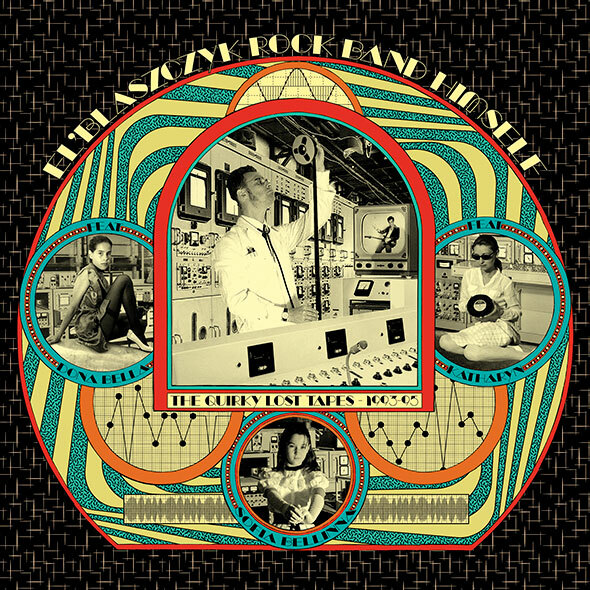 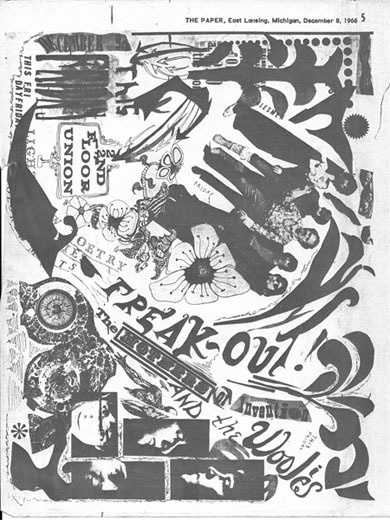 Contents include: (deep breath) Hauntology, Acid Folk, Folk Horror, Ghost Box Records, The Wicker Man, Peter Strickland, Finders Keepers, Vashti Bunyan, Broadcast, Children Of The Stones, psychedelic cinema, The Owl Service, Kate Bush, The Stone Tape Theory, The Folklore Tapes, Jane Weaver, Howlround, the BBC Radiophonic Workshop and lots, lots more. 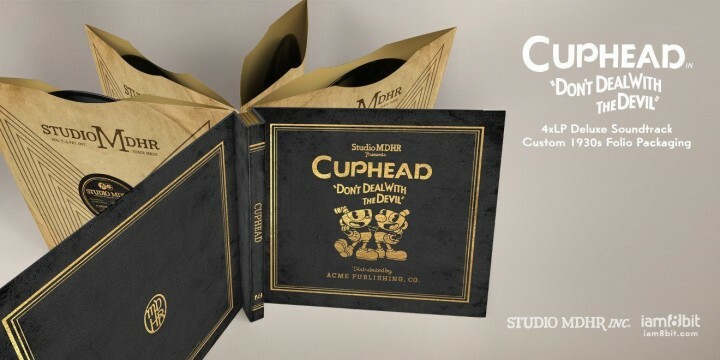 I’d say that’s more than enough reasons to order a copy right there and that it’s the first book of it’s kind to catalogue all these disparate strands, many of which cross over time and space to influence one another. 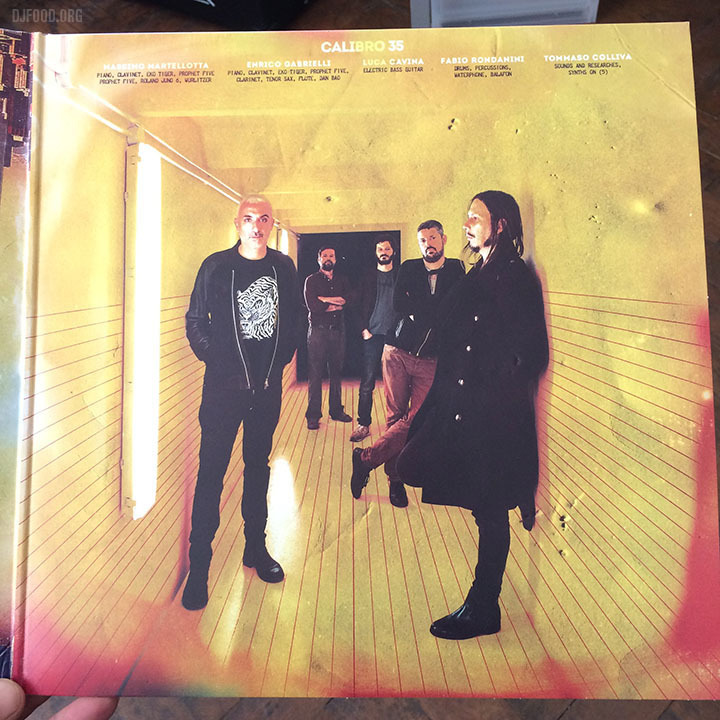 It’s also available via their Bandcamp and you can peruse the, now extensive, release catalogue that’s sprung from the site, even if the monochrome nature of all their releases makes it increasingly harder to discern one from the other. 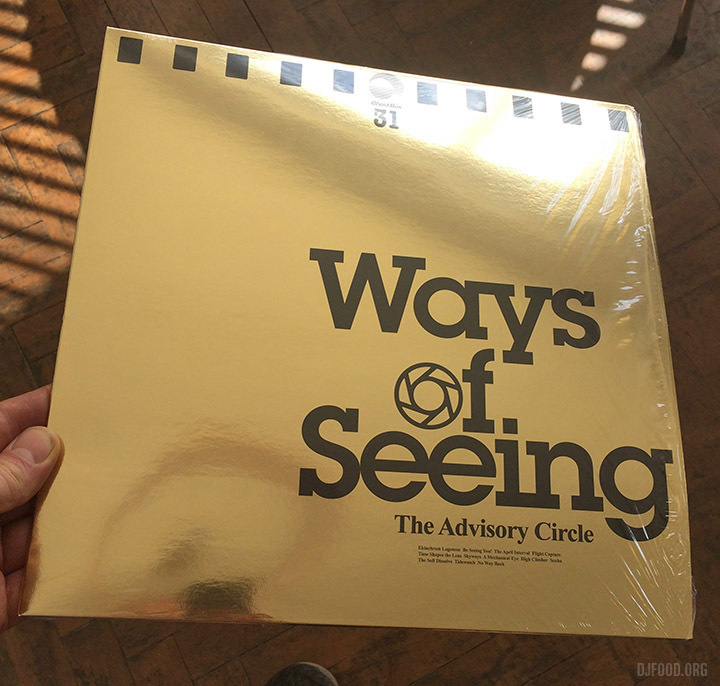 The label is a completist’s joy/nightmare being that they make night/day or dawn/dusk editions of each release but as a singular vision it’s a beautiful set of objects when seen en mass. 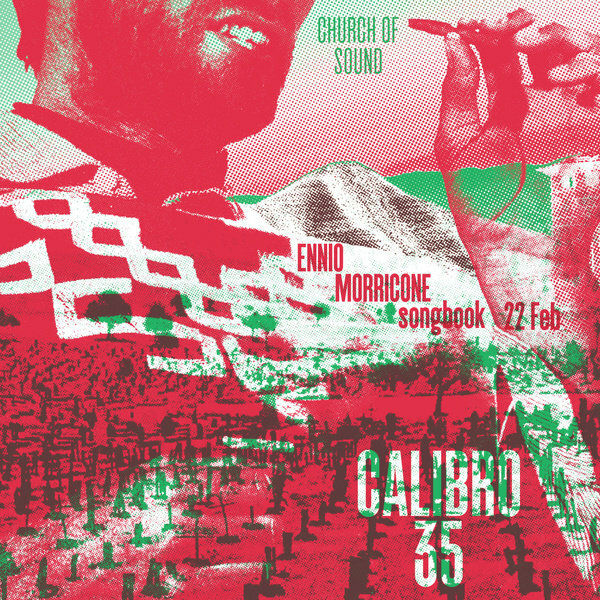 The Italian quintet are back with a new album, video and tour, reaching the UK this week with a special Morricone songbook set at the Church of Sound on Thursday. 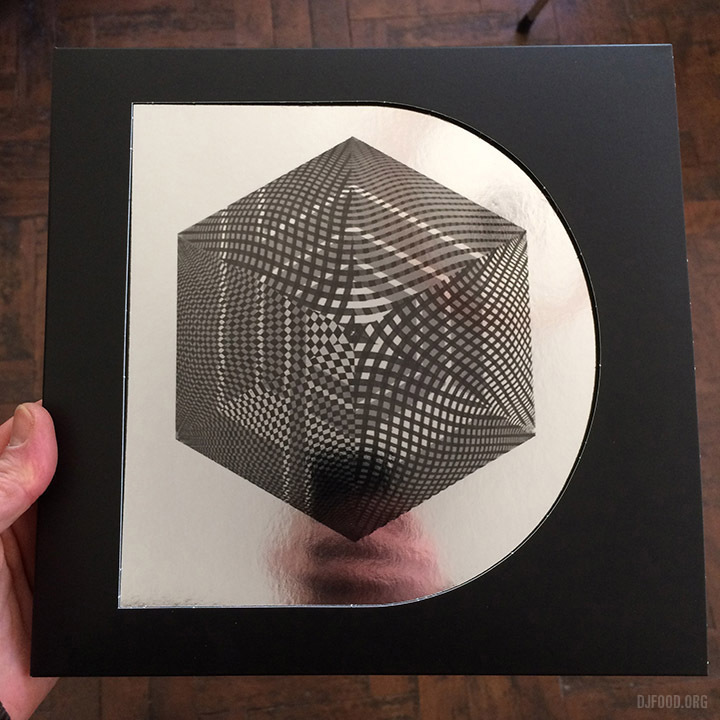 The new album, ‘Decade’, looks and sounds fabulous and their new video is nuts, the weirdest one yet. 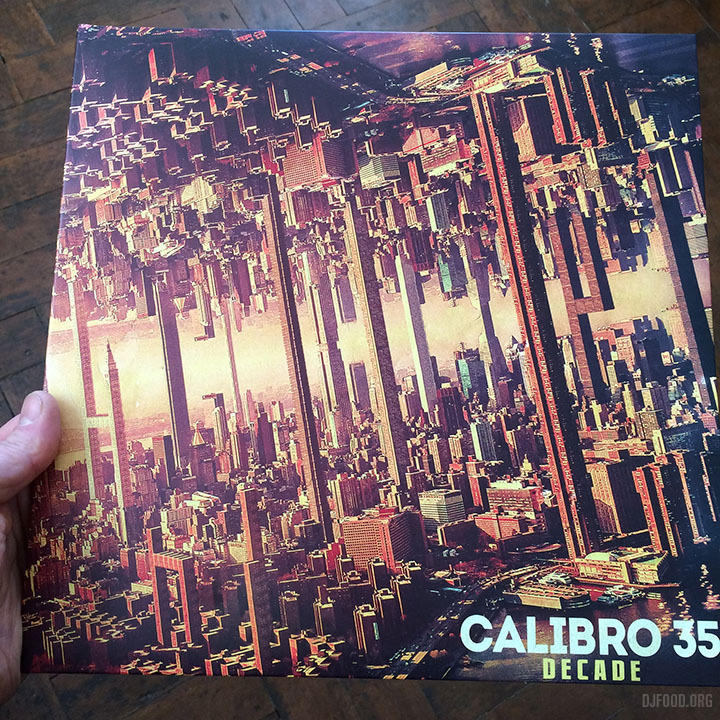 If you’ve never seen a Calibro 35 video, go and check them out on YouTube, always high quality, super stylish and original. 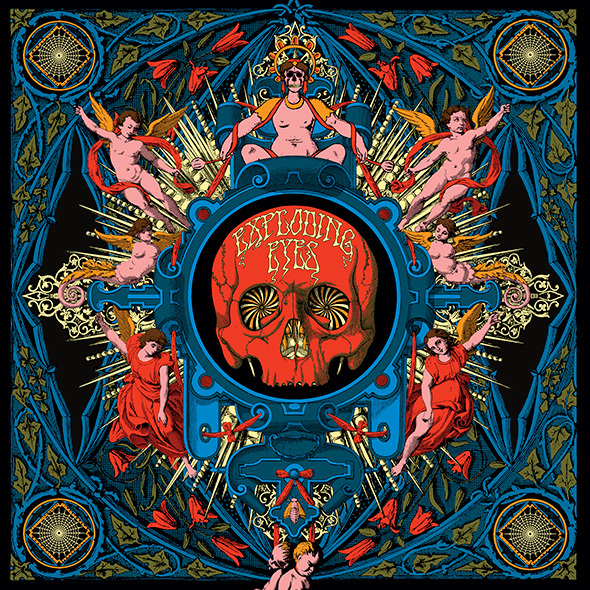 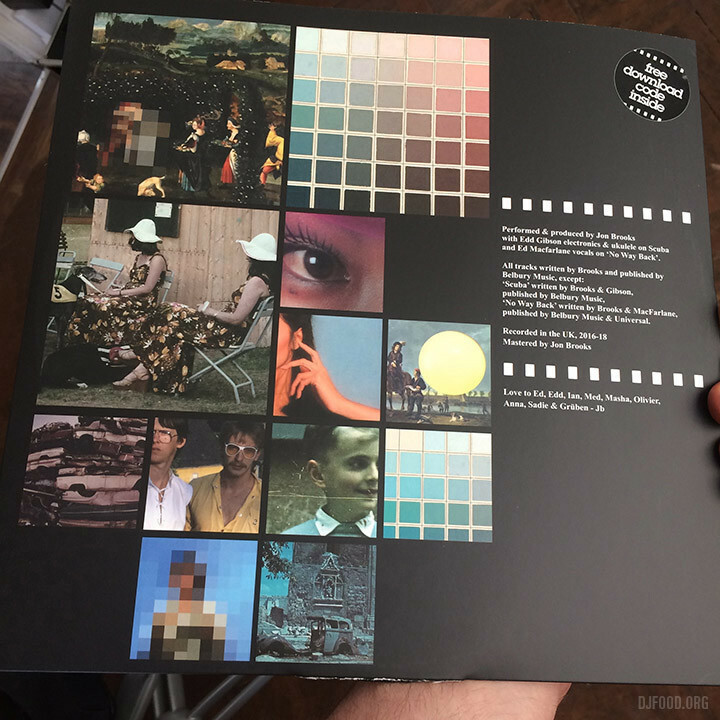 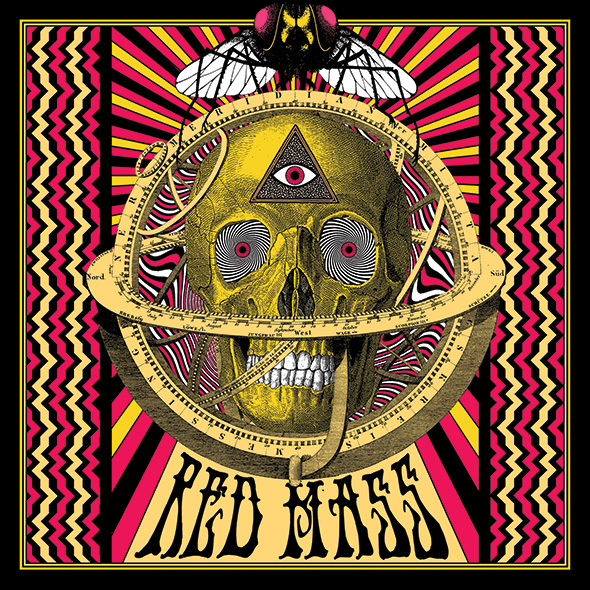 The album is available is a number of bundles over on their Bandcamp: gatefold vinyl, cassette and CD and with optional black or clear vinyl 7″ too. 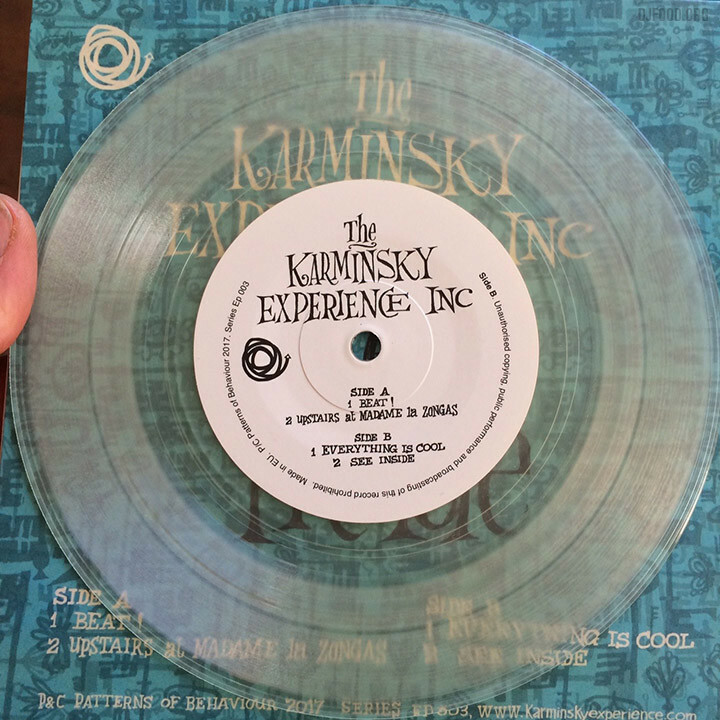 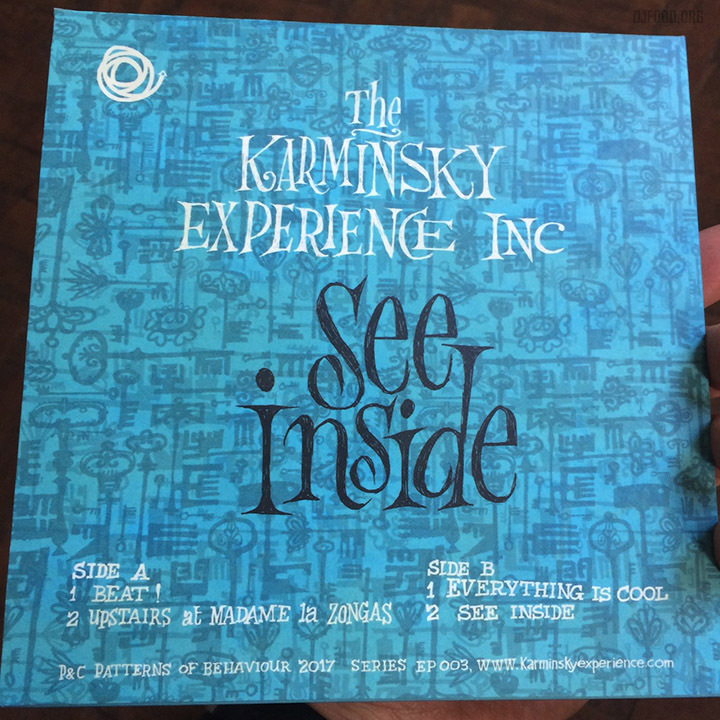 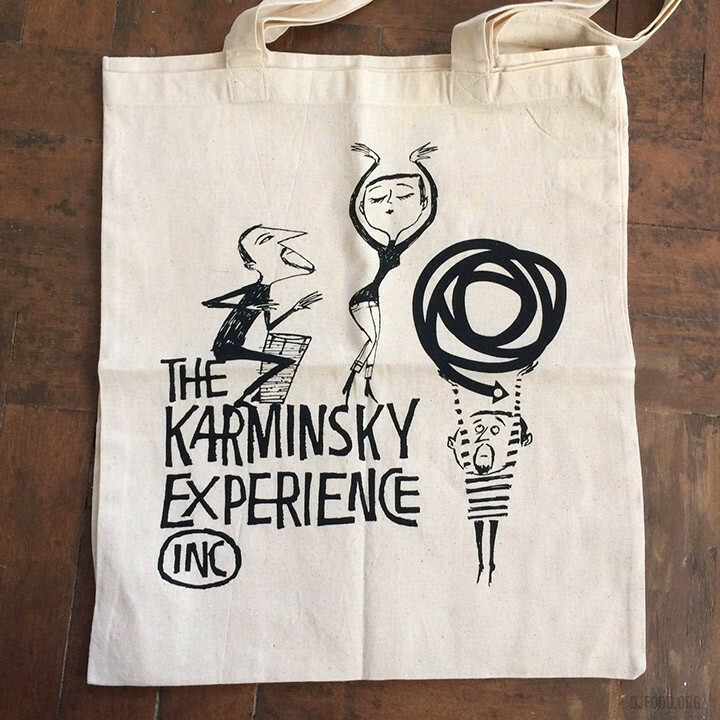 This beautiful object is the latest release from The Karminsky Experience Inc. – a four track 7″ with three tunes from the ‘Beat!’ album of last year plus a new collage and gorgeous sleeve art by Steve Millington aka Dry British. 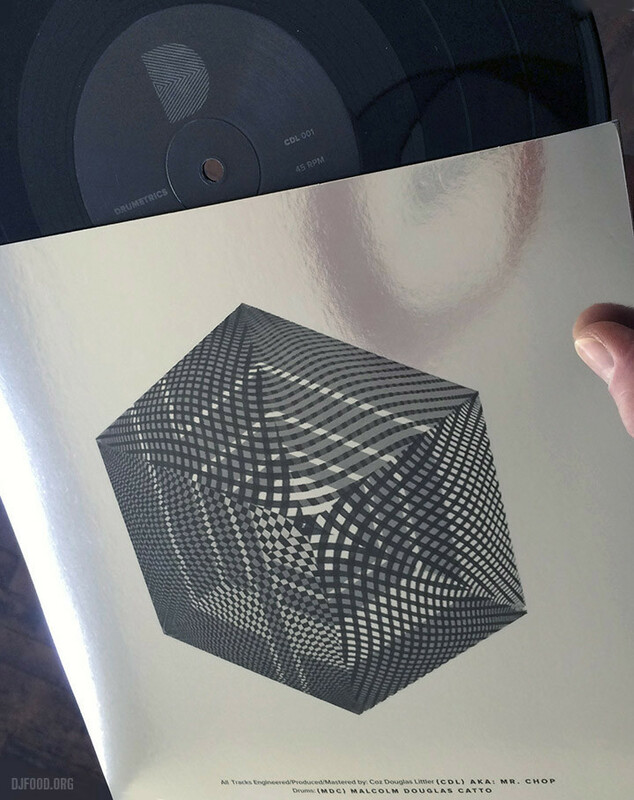 There are only 100 copies so be quick and order via their Bandcamp page. 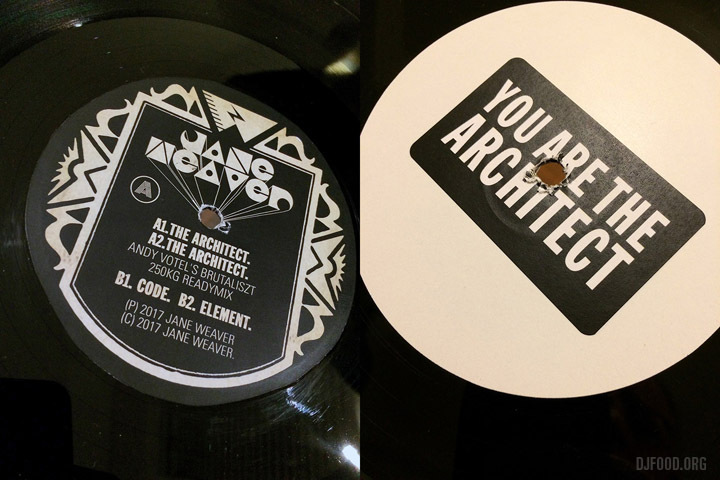 One day last Autumn a mystery package arrived containing various Finders Keepers records and one very special, handmade 12″ of Jane Weaver‘s ‘The Architect’ single. 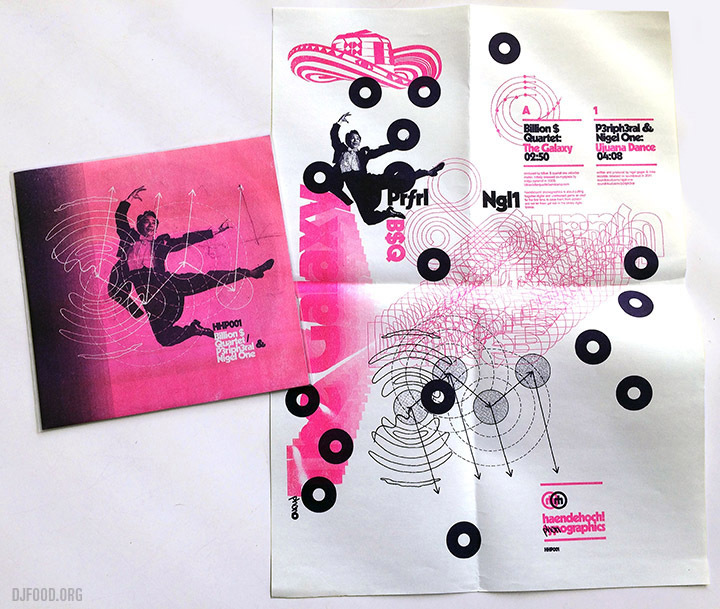 One of an edition of 10, it’s a thing to behold; a test pressing hand-labelled with a paste up cover containing one of my favourite designs of last year (see this post). 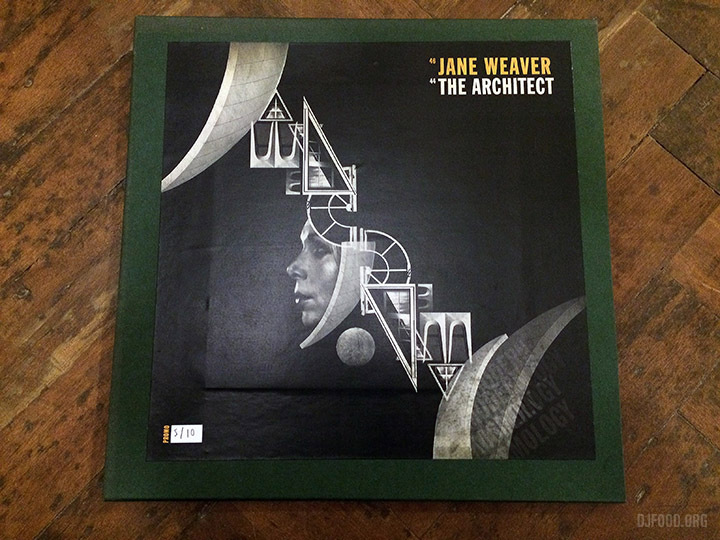 Being one of the people urging the designer to make prints of one of his posters for Jane’s Manchester gig I was gutted when my copy got lost in the post over the Xmas period. 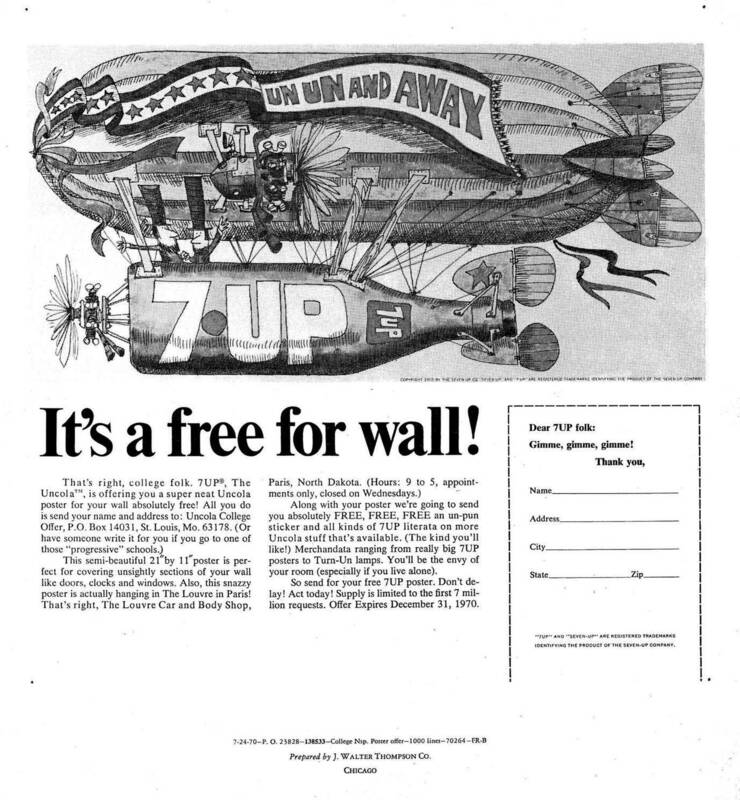 Luckily a replacement is soon to be on its way. 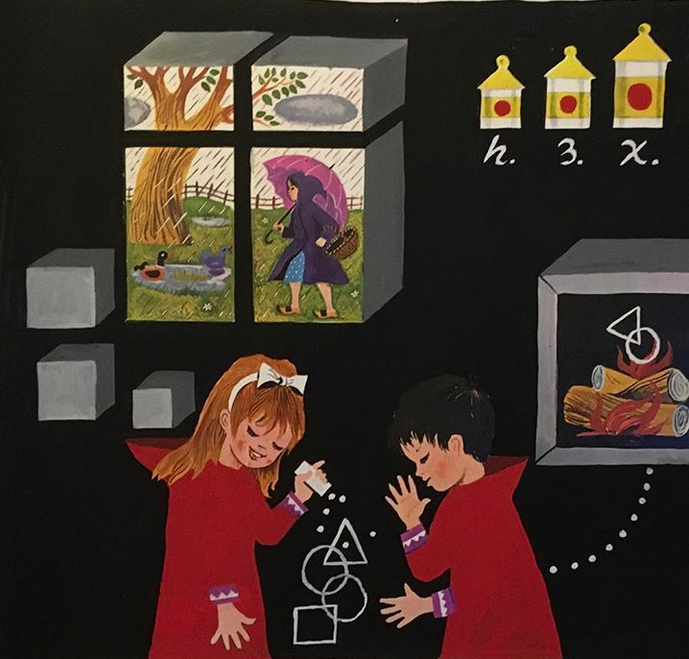 The ‘architect’ of these creations is one of my favourite contemporary designers, Andy Votel, who will be exhibiting some previously unseen self-initiated full size paintings / collages in Manchester from the 25th at Electrik in Manchester. 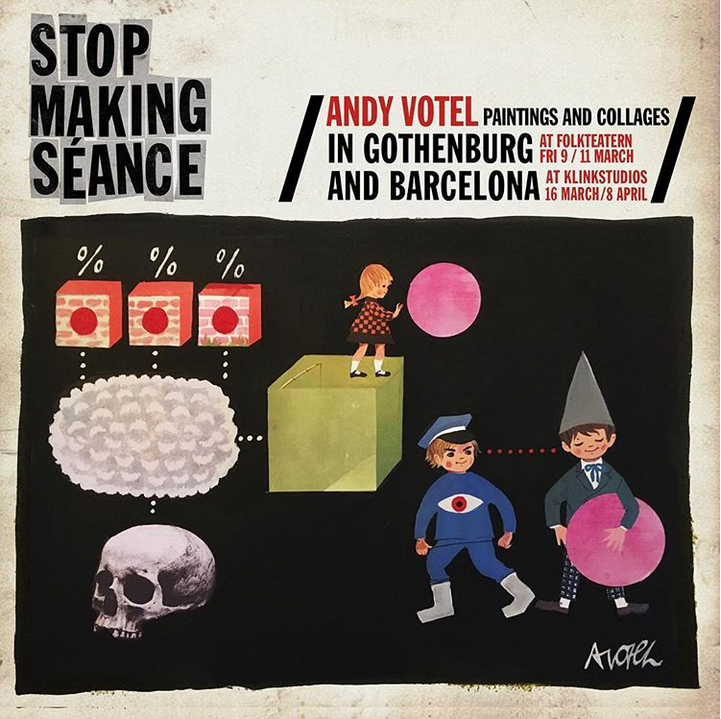 From the press release: “Writer, DJ, designer, broadcaster, label boss and anti-musician Andy “Votel” Shallcross displays a series of original personal works created, at home, in October / November 2017. 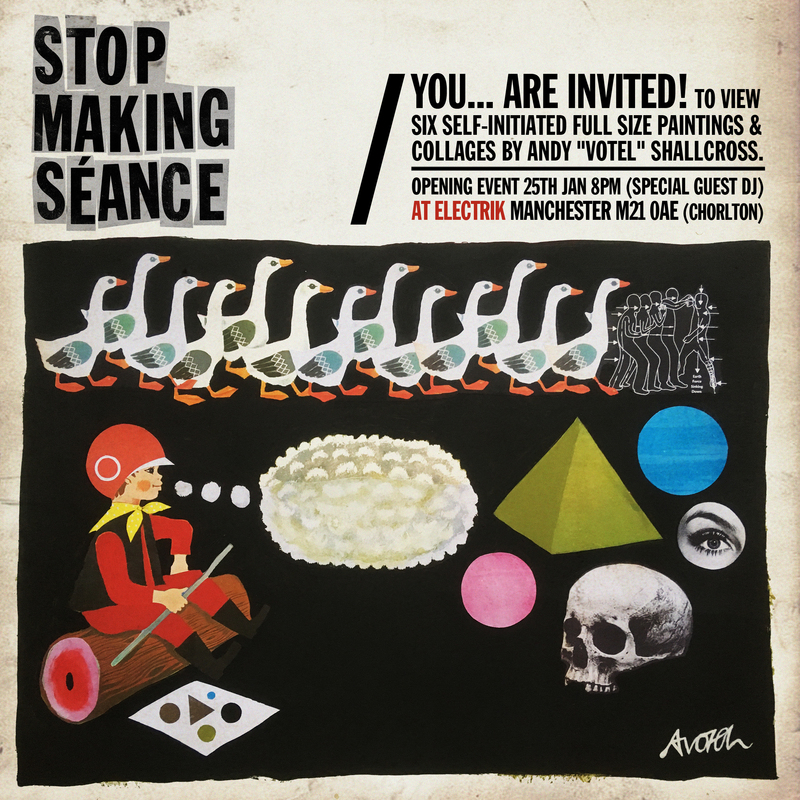 Based around contemporary “fakelore”, reducing influences of European science-fiction art, scholastic illustration, post-pop-art, Plakatstil and mid-century graphic design Andy uses simple methods of painting, collage, deletion and recontextualisation for these one-off, large format placards. 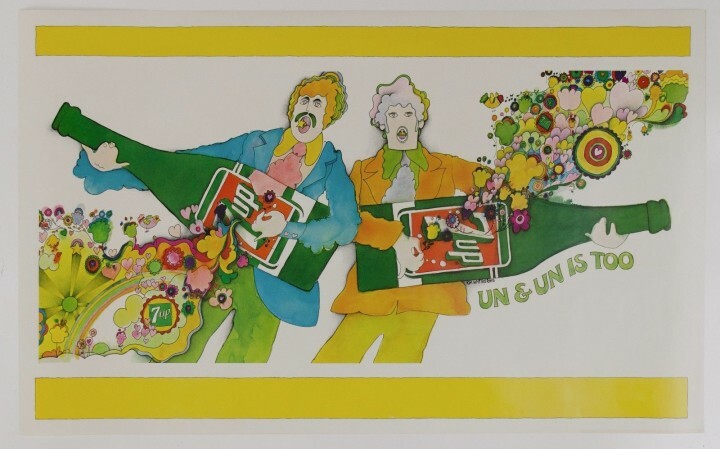 Browsing eBay over the Xmas holiday, a friend came across a psychedelic Submarine poster not a million miles away from Heinz Edlemann’s classic Yellow variant, created for The Beatles‘ film of the same name. 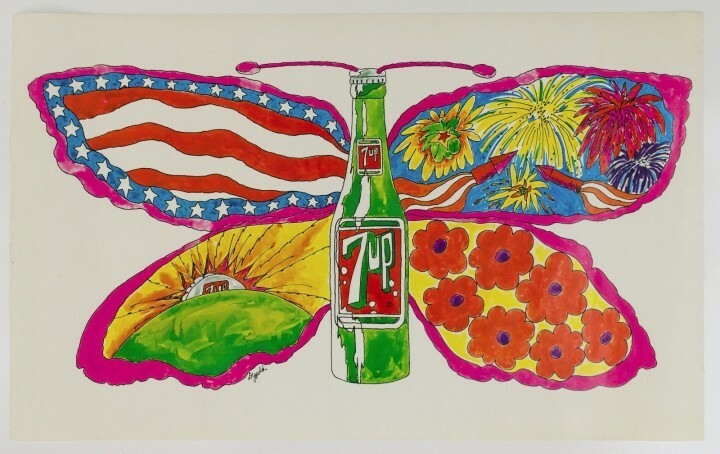 In the same brightly-coloured, cartoonish style of the late 60s and early 70s – much popularised by artists like Edelmann, Milton Glaser, Nicole Claveloux and Peter Max – this sub was in fact green and advertising the drink, 7Up – billing itself as ‘The UnCola’. 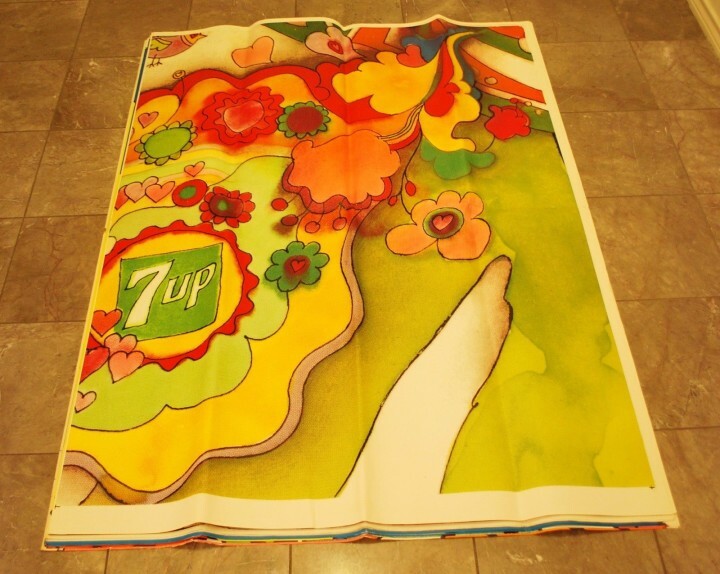 What was remarkable about this eBay listing though was that it was for an original 60″x36″ poster, not the sort of thing that turns up every day. Indeed, further investigation revealed that the seller, Dallas resident, Robert Trent, is the foremost collector of this era of 7Up advertising and was selling off duplicates from his collection. 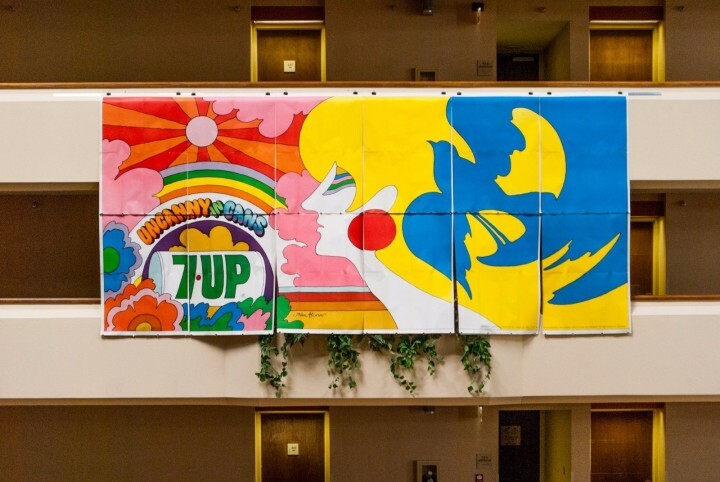 Even crazier was that he was also selling huge billboard versions of some of the designs, some as an un-pasted set of 12 panels over 12 meters in length. Over the course of many entries he had compiled a huge resource of information, links and imagery, all expertly checked and presented without fuss and in meticulous detail. 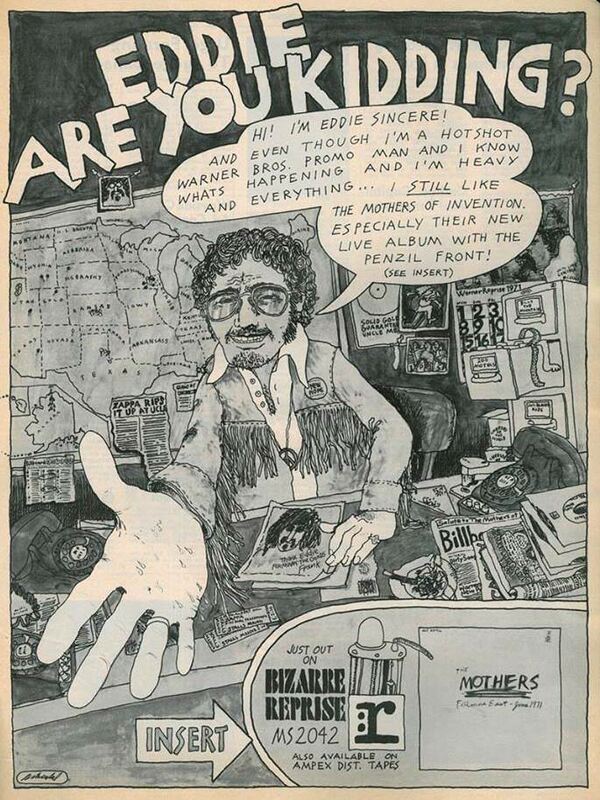 These kind of posters don’t come up every day and he has the whole history up there to give context to the images. 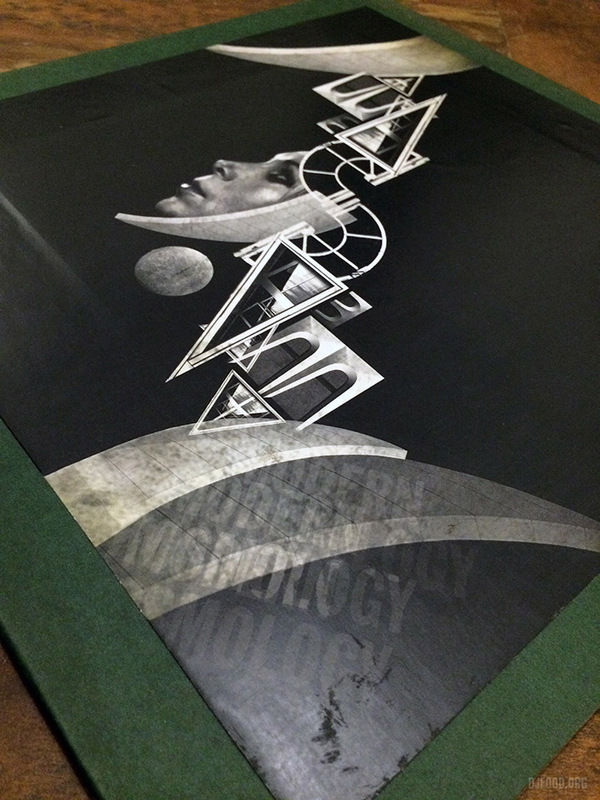 After seeking his permission I hereby reproduce some of the imagery and details before it’s lost. From Robert’s listing: “‘Wet Un Wild (green submarine, aka yellow submarine) 60” x 36” horizontal poster by Ed George. 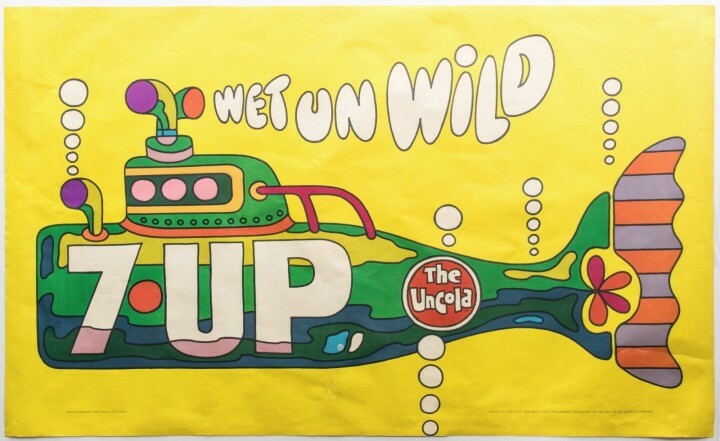 Note: This is made of thick quality poster paper, not dimpled yellow plastic tablecloth material (modern-day Tyvek construction wrap vapor barrier or “paper dress” nylon material) like the other “Wet Un Wild” posters occasionally offered on eBay. 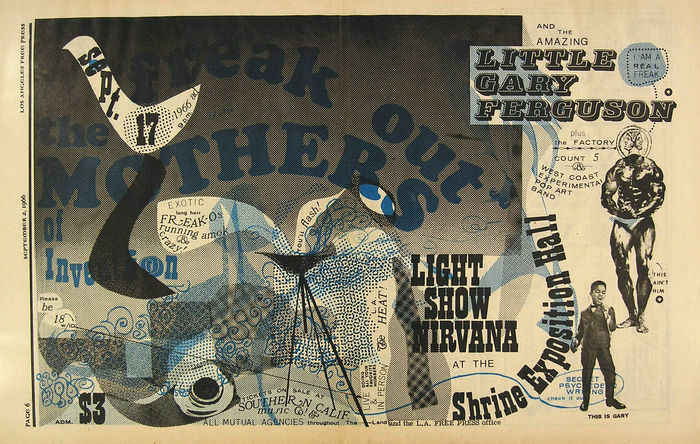 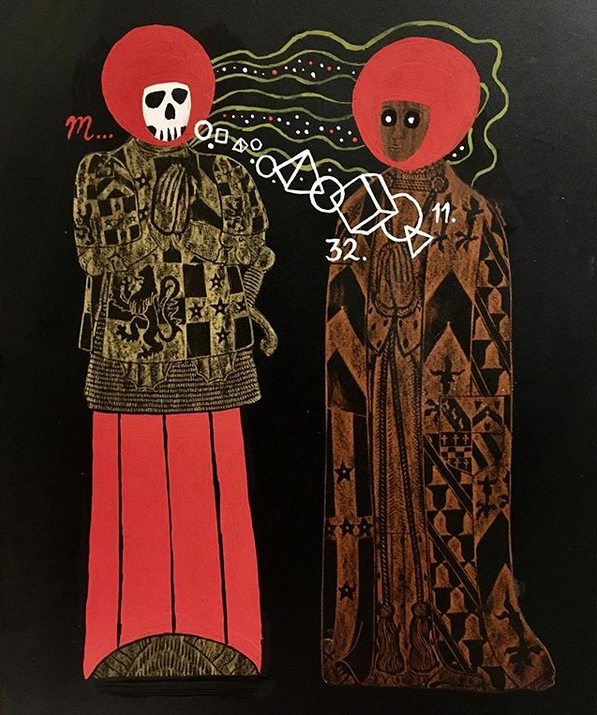 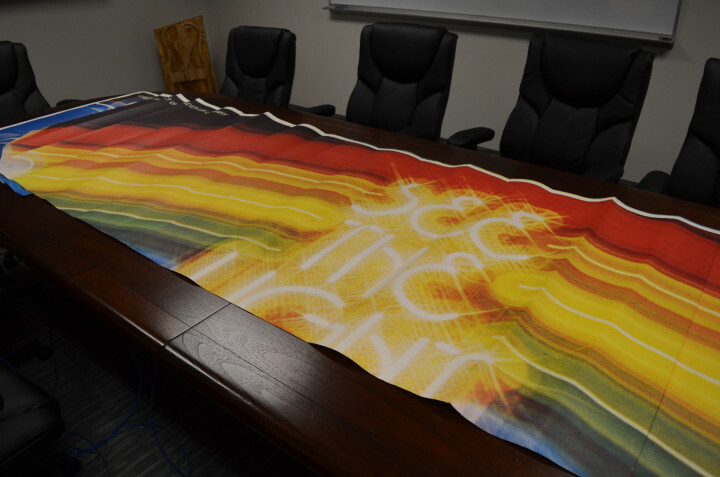 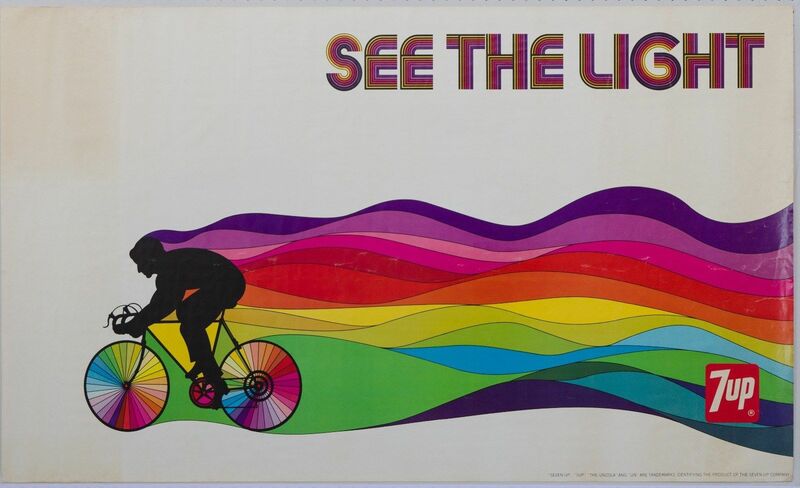 From Robert’s listing: “‘The Light Shining Over The Dark’ This is a vintage 33″ x 20″ horizontal poster that is in excellent condition and VERY RARE. 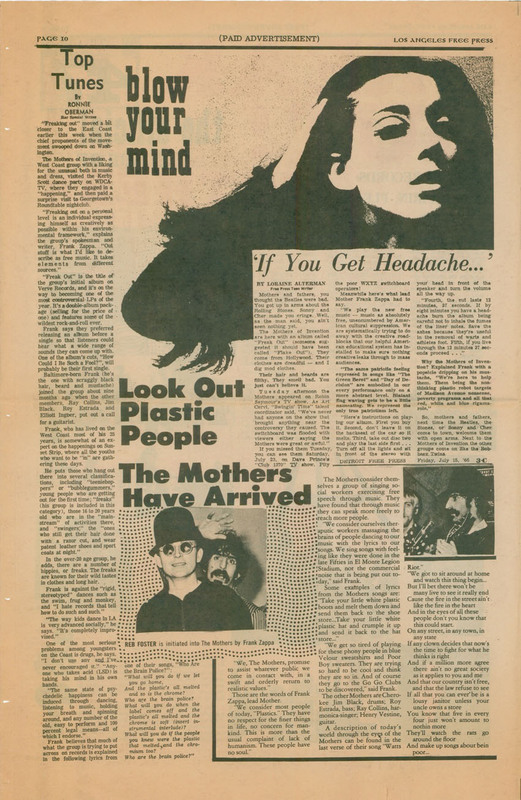 I’m only aware of 2 or 3 other copies, some of which have passed through my hands. The artist’s signature can be seen at the right center in the bottom of the girl’s white dress. 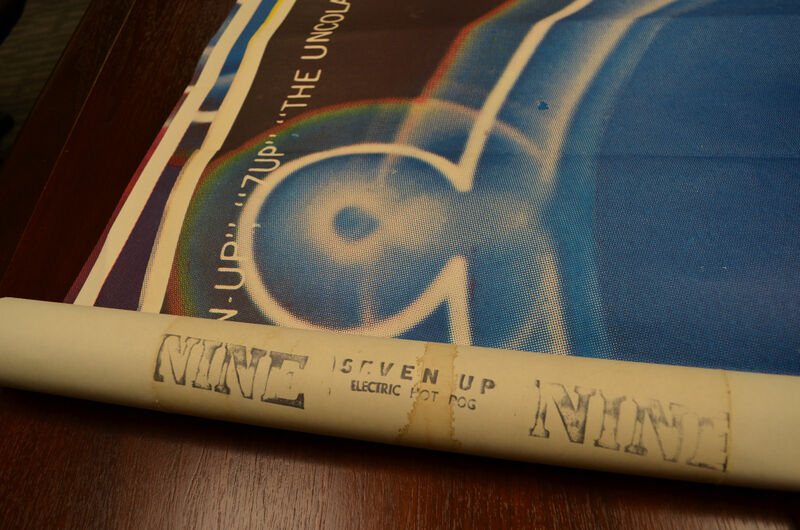 From Robert’s listing: “‘UnCannny In Cans’ This is a vintage 33 3/4″ x 20 3/4″ poster that is in excellent, near mint condition. 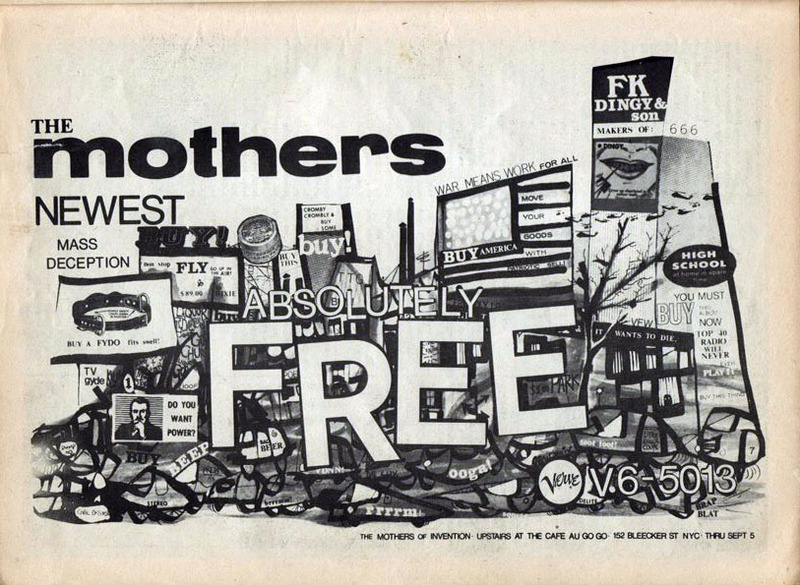 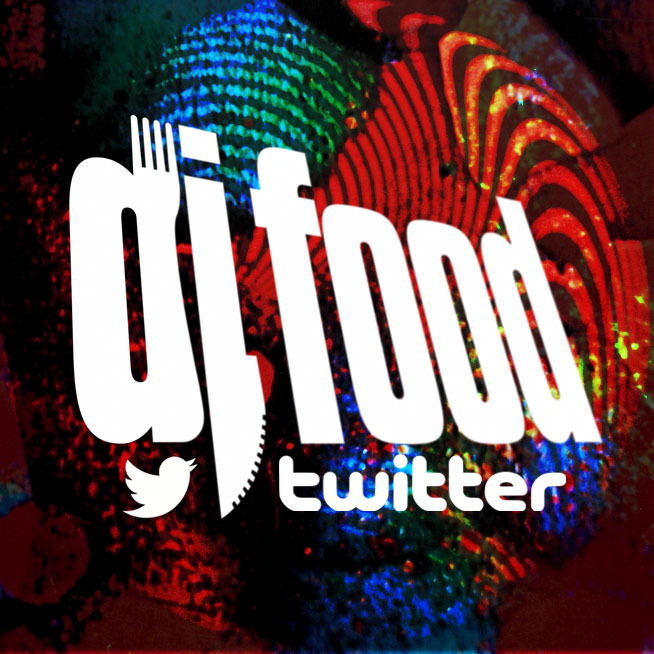 This is an authentic, traceable representation of late ’60s, early 1970’s pop art advertising. 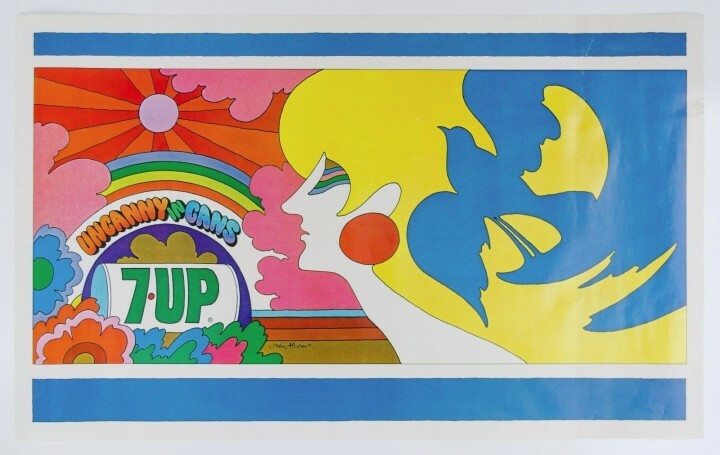 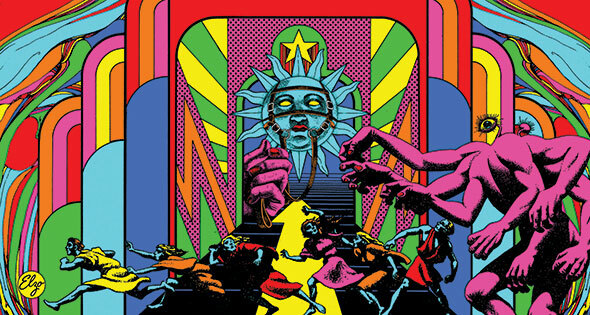 The artist was John Alcorn who illustrated this in 1969 as a free-lance artist. 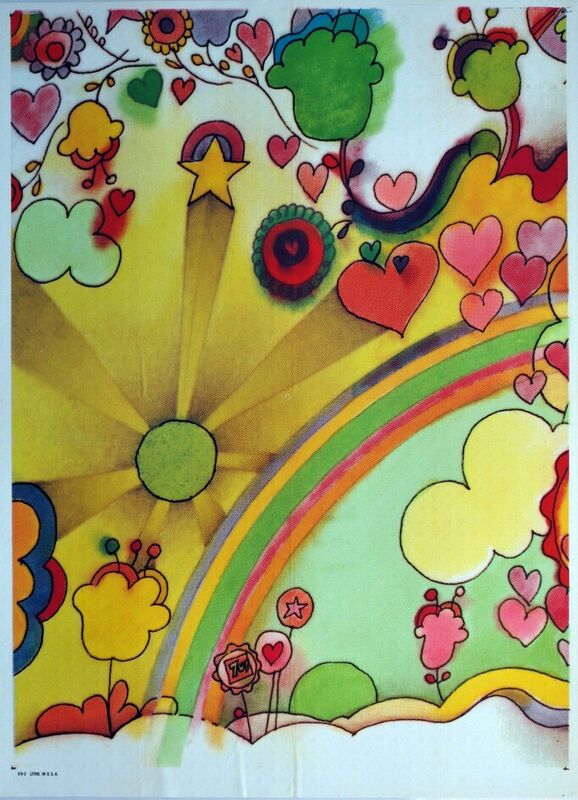 His signature is in the bottom middle brown band. 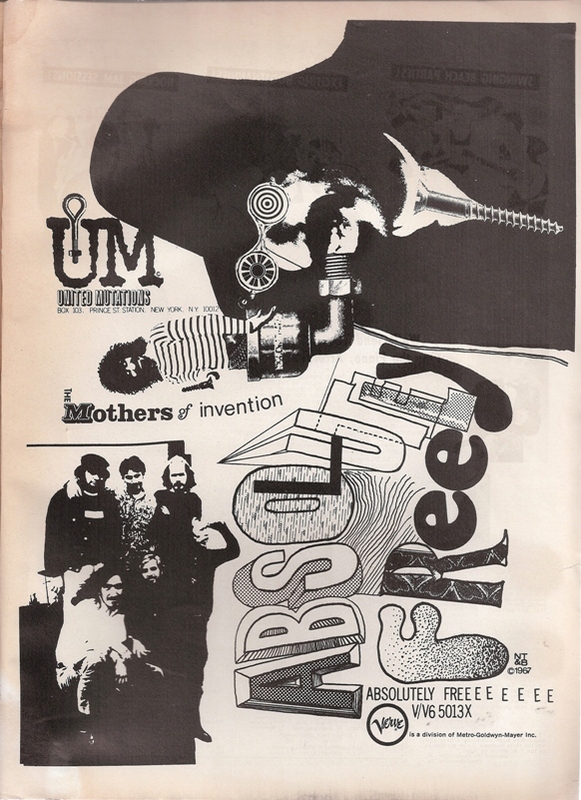 At the age of 24 Alcorn was the 4th person to join Push Pin Studios which was the place to be in the graphics community at the time. The Seven Up Co. sold 4 different sizes of most images to the general public. 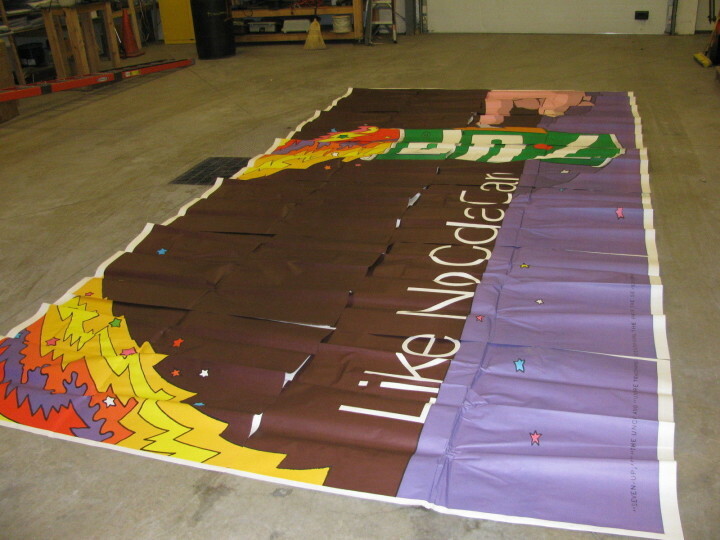 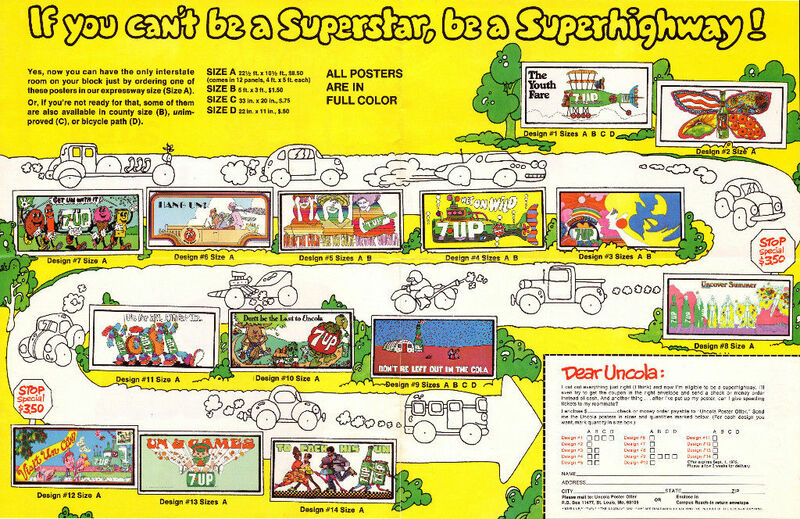 BTW – My collection also includes one of the “UnCanny In Cans” Size “A” billboards plus a 60″ x 36″ Size B” version. 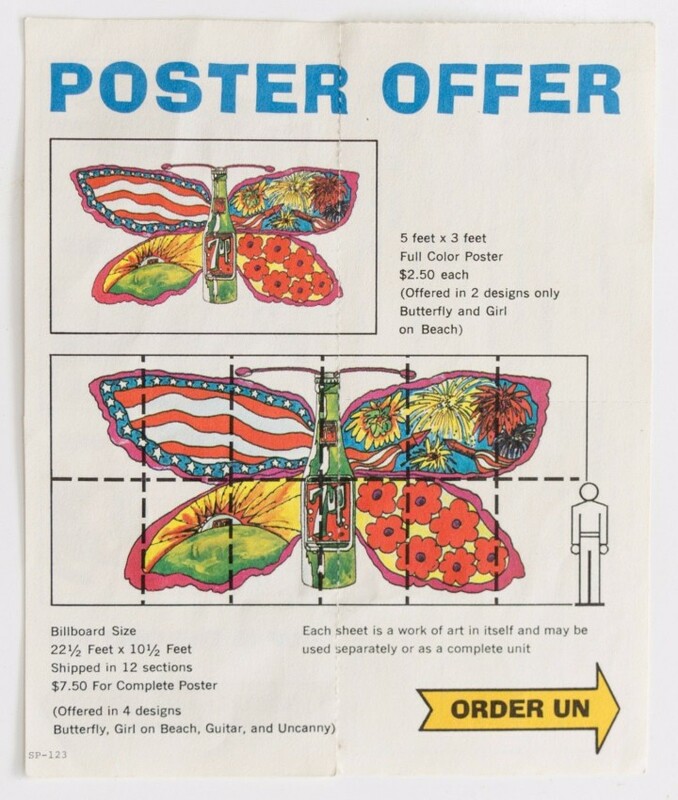 The poster for sale here is a 34″x21″ Size “C”. 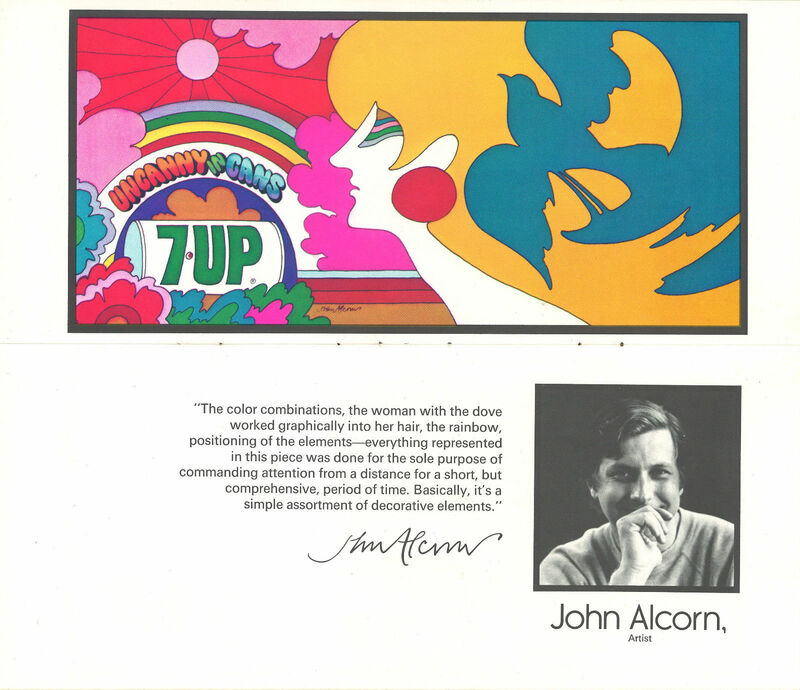 John did a number of well known illustration advertisements in the prior years for Pepsi and Campbell’s Soup and his career flourished for many more years. These outdoor ads (billboards) were commissioned by the J. Walter Thompson [advertising] Company of Chicago (JWT) that orchestrated the famous UnCola ad campaign from about 1968 through 1975. Most of the 53+ extremely colorful billboard & poster images were illustrated by invited outside freelance artists who were allowed to sign their names on the originals if desired – not all did. 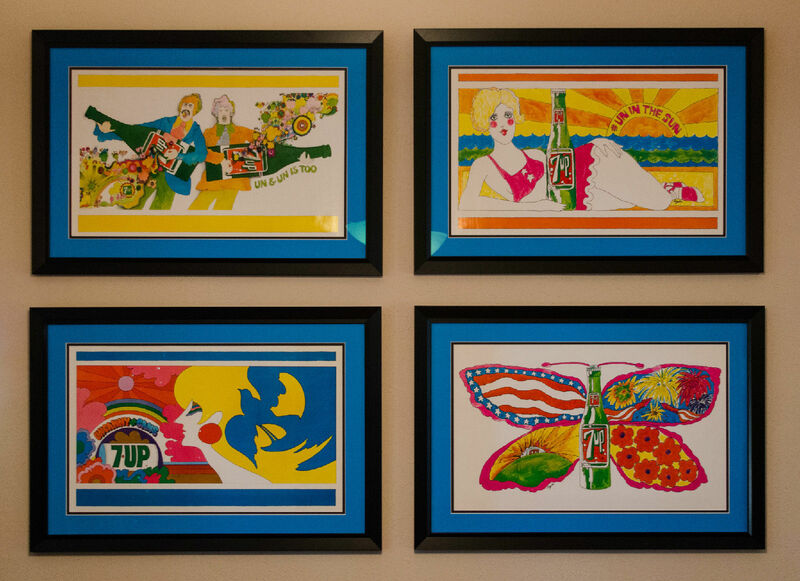 Only a few images were produced in-house, and never with the artist’s name on them. JWT wisely chose to invite only up and coming artists and not well known graphic stars so as not to let the notoriety overshadow the product itself. 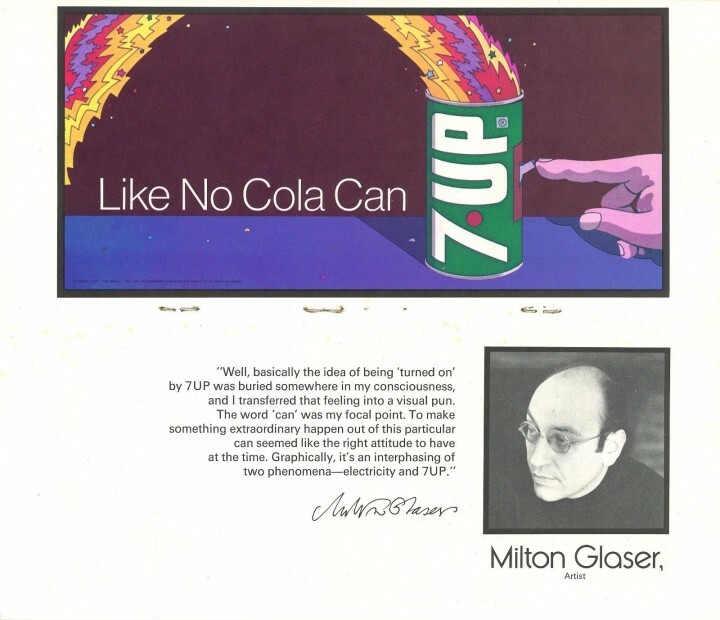 Many of the artists have gone on to great fame in the graphics community Milton Glaser (I [heart] NY logo) (Mad Men final Season 7 poster; co-founder of Push Pin Studios), Seymour Chwast (co-founder of Push Pin Studios) with Isadore Seltzer, John Alcorn (Push Pin Studios), Kim Whitesides, Barry Zaid, Jacqui Morgan, Simms Taback (1st Happy Meal Box in Smithsonian & Caldecott Honor for children’s books), Skip Williamson, Robert Abel (Tron movie), Charlie White III (permanent collection at MOMA), John Craig, Ray Lyle, Heather Cooper, Nancy Martell, Roger Chouinard, Pat Dypold, Bob Taylor, Tom Kamifuj, Bill Bosworth, Ed George, Joanne _ and probably several others. From Robert’s listing: “Bob Taylor was an art director at the famed J Walter Thompson [advertising] Company based in Chicago – the Midwest Mad Men. 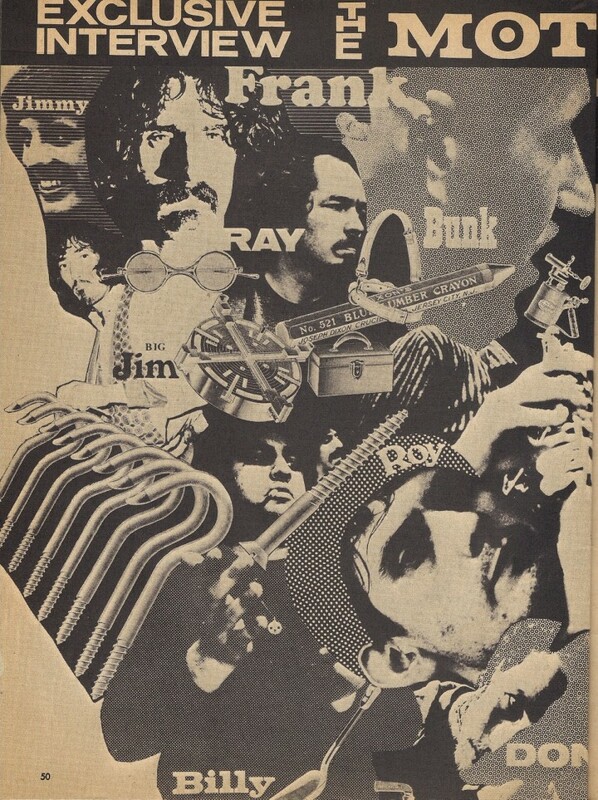 An American Contemporary Graphics Exhibit booklet from about 1972 featured Bob and a different “cartoony” billboard image of his on pages 9-10. 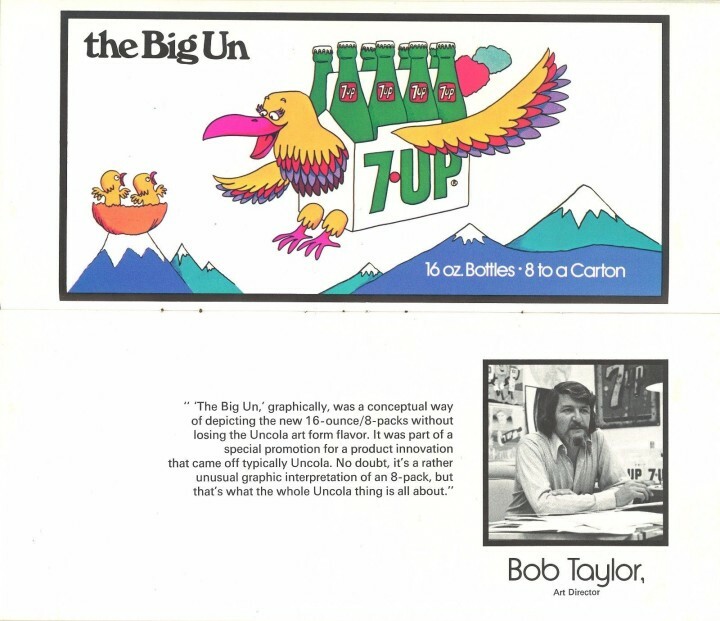 Bob was one of the driving forces behind “The UnCola” ad campaign from the beginning in 1968 until the end in the middle 1970’s. 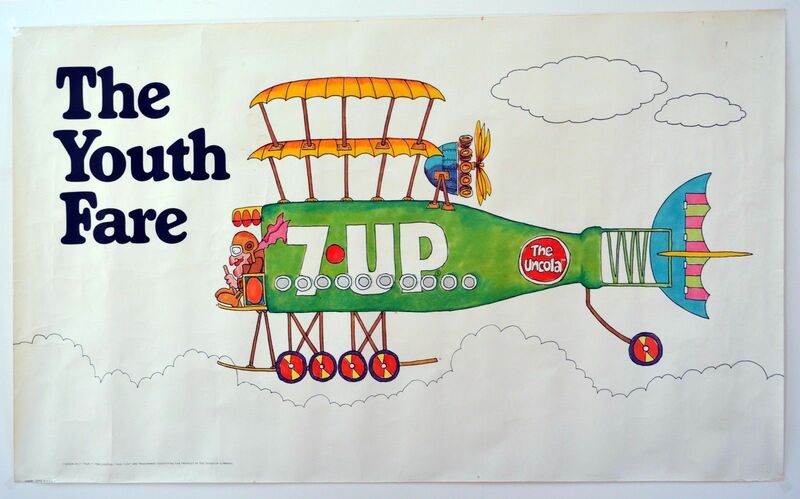 Bob also illustrated “The Youth Fare” in a similar “cartoony” style depicting a green bottle of 7Up as a bi-plane. 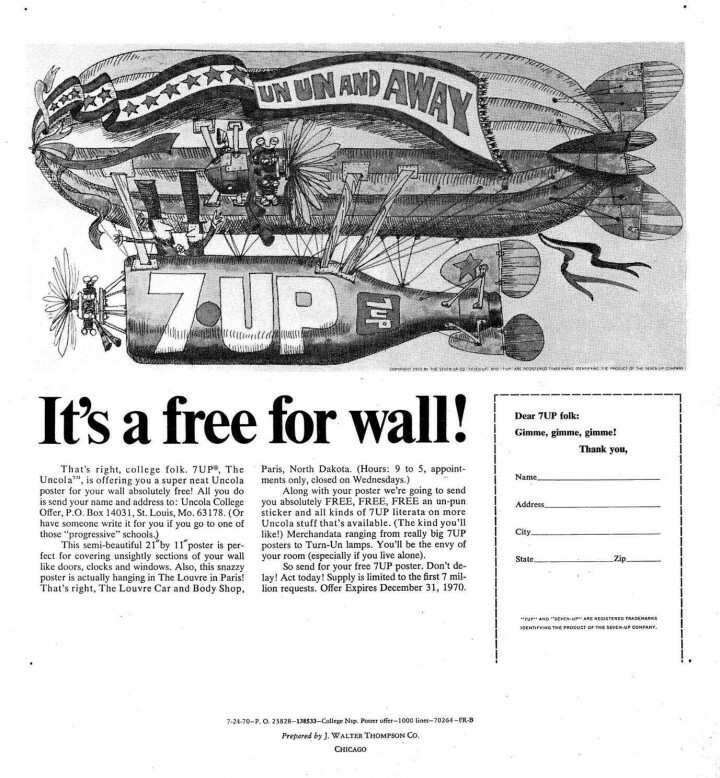 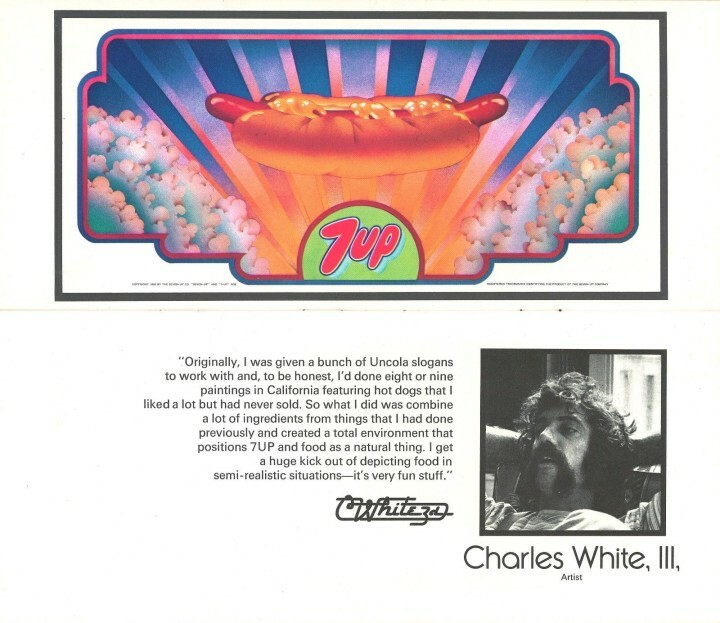 This is the 21’x10′ Size “A” billboard version of this blimp image by Bob Taylor available as Design #10 for $7.00 in the billboard and poster offer that expired on 5/31/72. 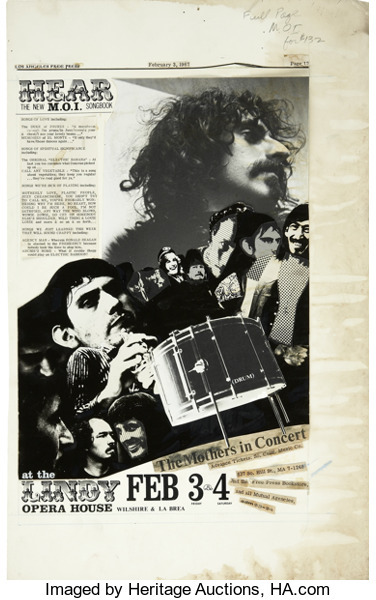 A small 21″x11″ poster was available for FREE if you responded to the poster offer that expired on 12/31/70. Another folding billboard and poster offer that expired on 5/31/72 offered this billboard as Design #12 for $8.50. 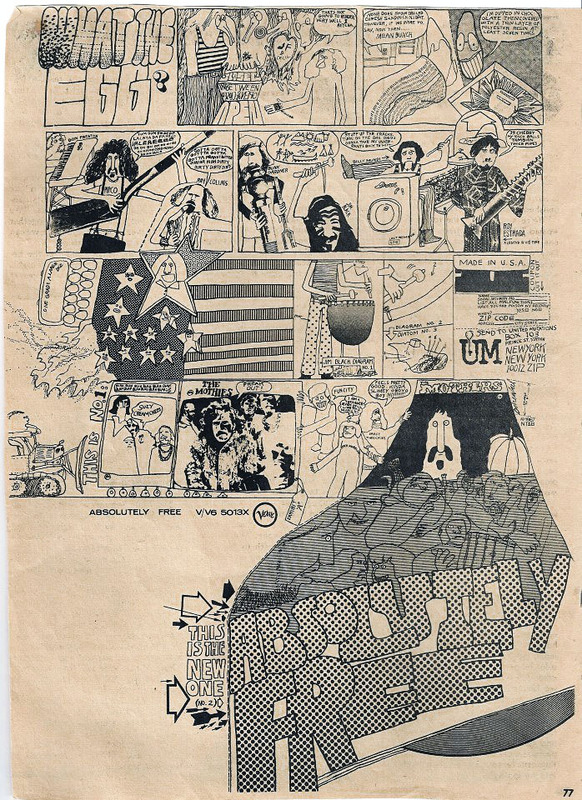 The American Contemporary Graphics Exhibit book laid out profiles of some of the artists along with their contributions and the aim of the campaign. 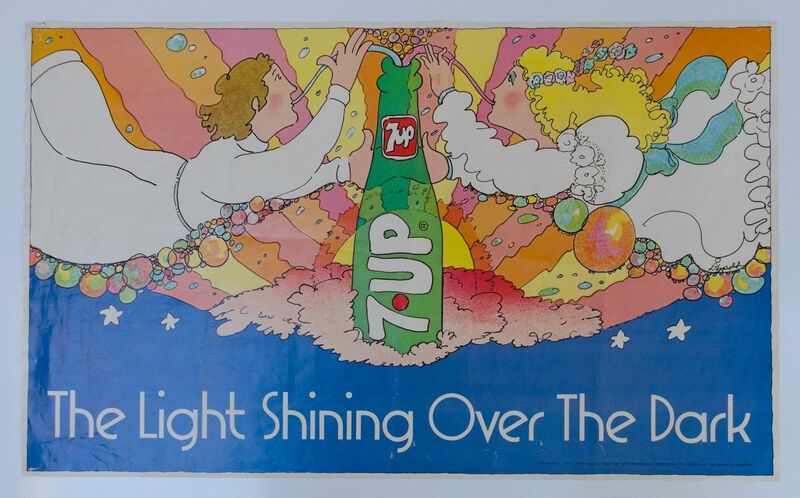 “Well, basically the idea of being ‘turned on’ by 7Up was buried somewhere in my consciousness, and I transferred that feeling into a visual pun. 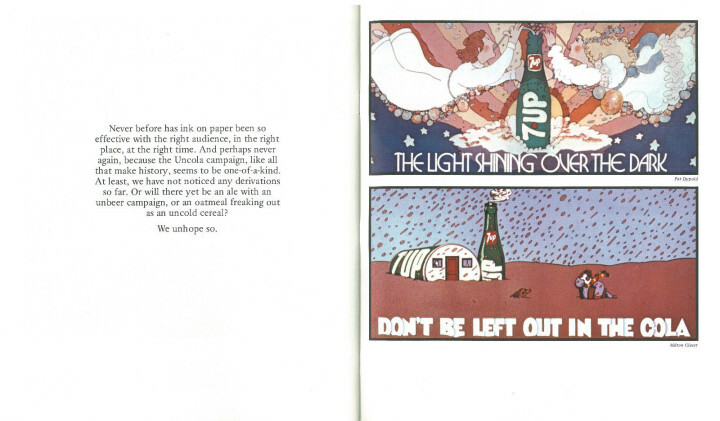 The word ‘can’ was my focal point. 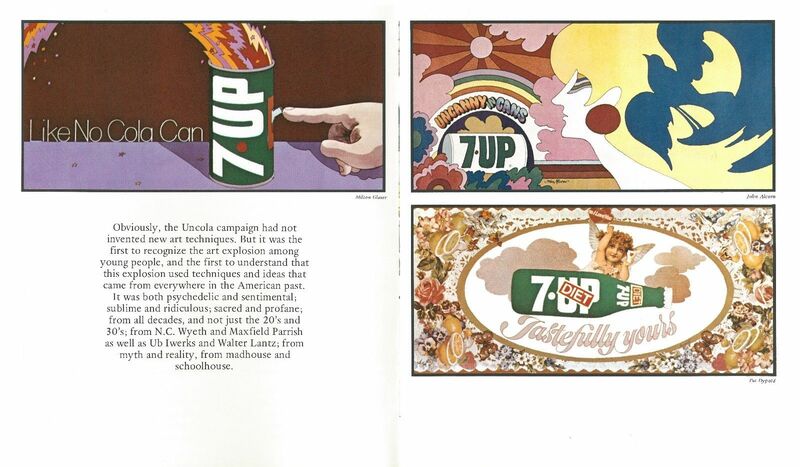 To make something extraordinary happen out of this particular can seemed like the right attitude to have at the time. Graphically, it’s an interphasing of two phenomena – electricity and 7Up”. 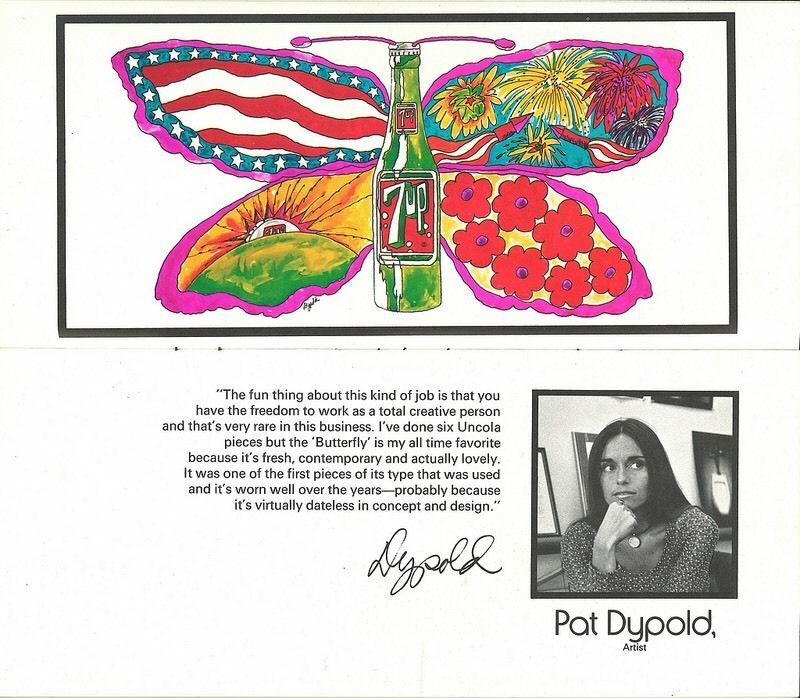 Pat Dypold seems to be the unsung heroine of the piece, contributing many illustrations in various styles but she’s not a name I’m familiar with. 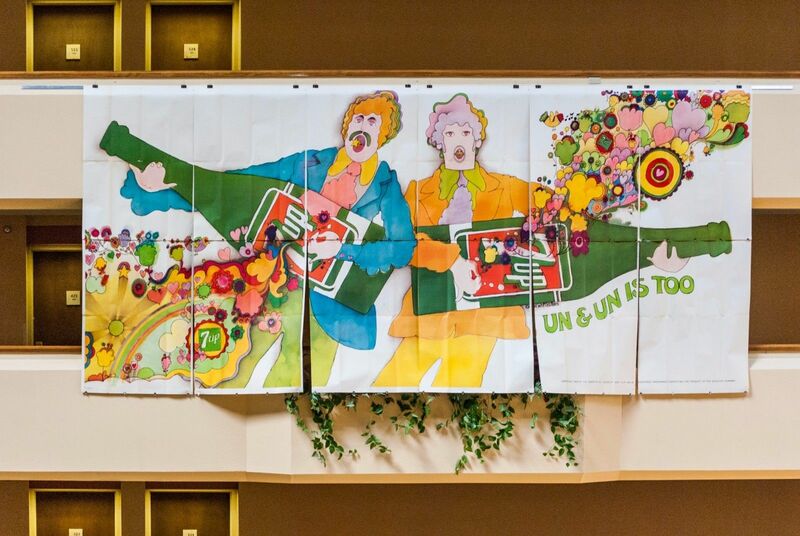 Robert had a class reunion and hung several of the billboards from the balcony at the venue they held it at, you get a sense of scale with these photos plus some close up details. 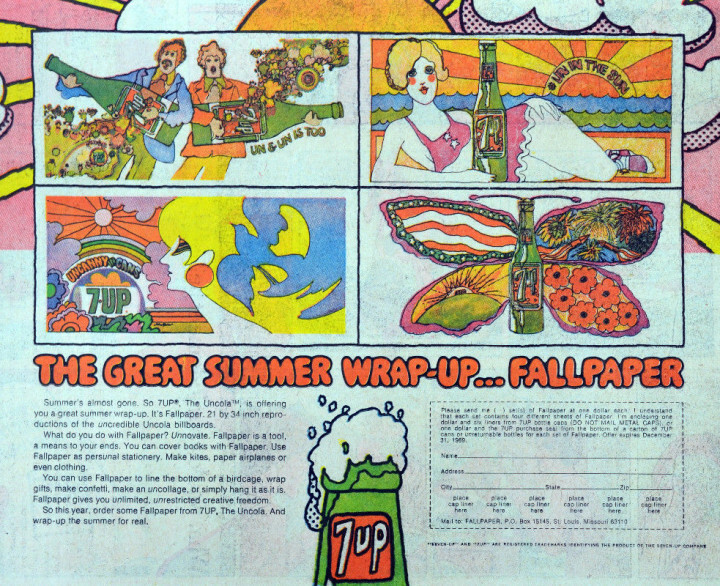 From Robert’s listing: “Giant 21′ x 10′ 7Up UnCola original unused vintage paper billboard illustrated in 1971 by Kim Whitesides. 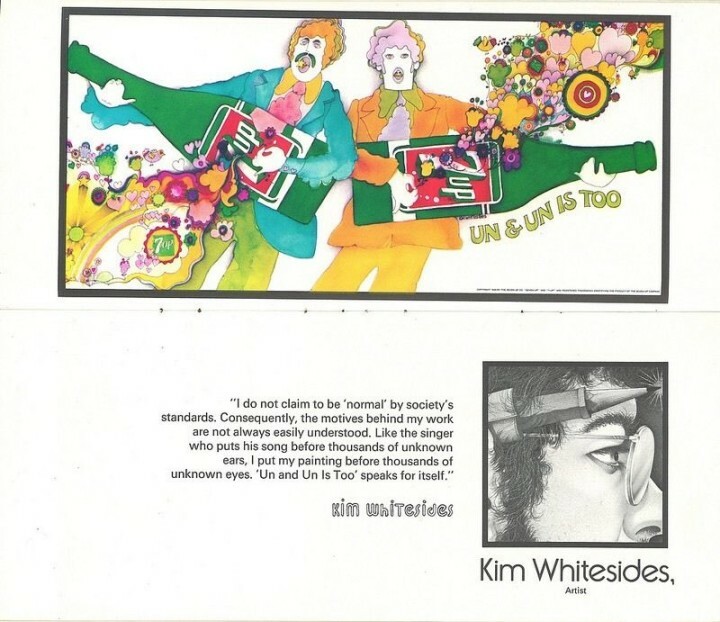 An American Contemporary Graphics Exhibit booklet from about 1972 featured Kim Whitesides and this image on pages 11-12. 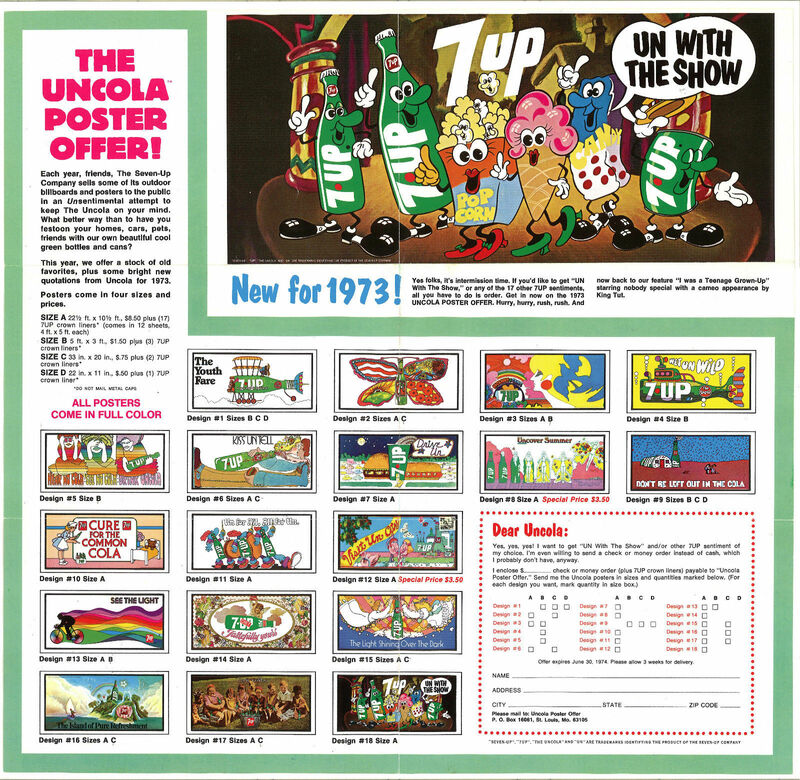 He did at least 3 other billboard images for The UnCola ad campaign, 2 of which were issued in billboard and/or poster formats. 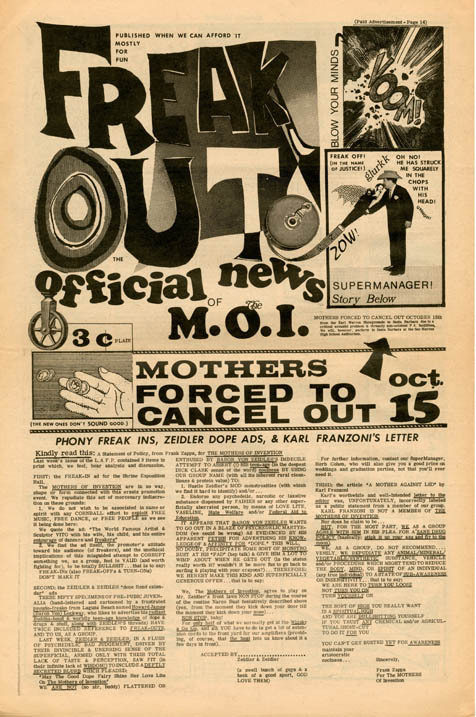 There are examples of many order forms including this fold up mail out, such great thinking going into something so ordinary. 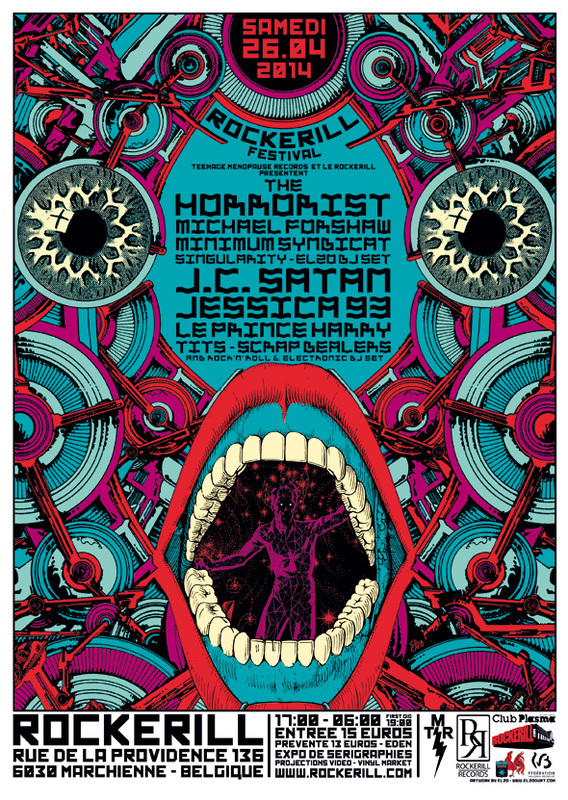 and one with the ever-reliable Dangerous Minds so head there if you want more info. 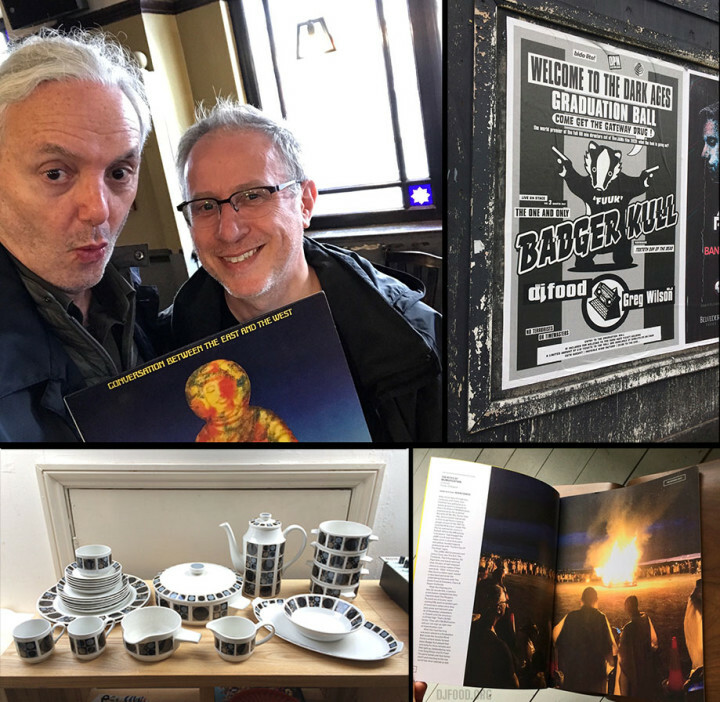 You can follow Robert on Instagram, view his whole collection on Flickr or peruse his eBay entries for yourself. 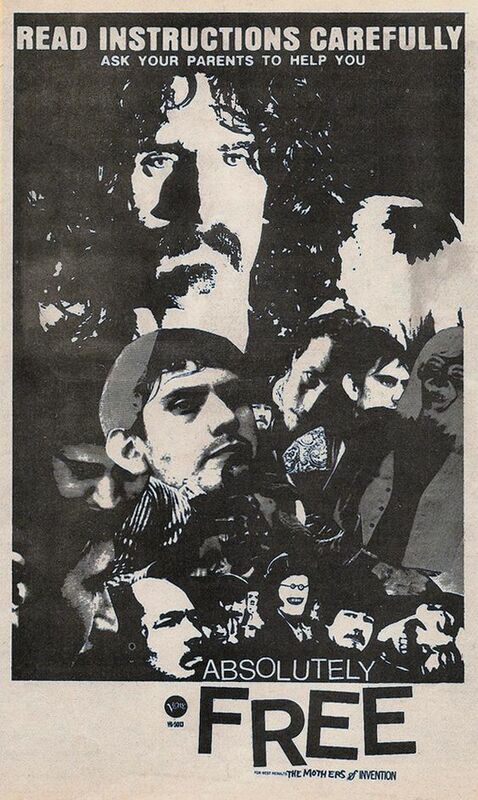 Masny thanks to Robert for letting me repost these pictures and info. 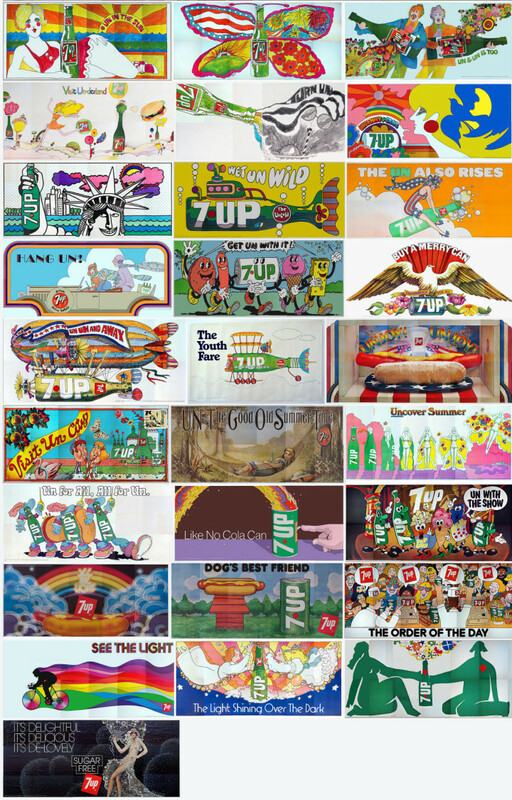 2017: WTF was going on? 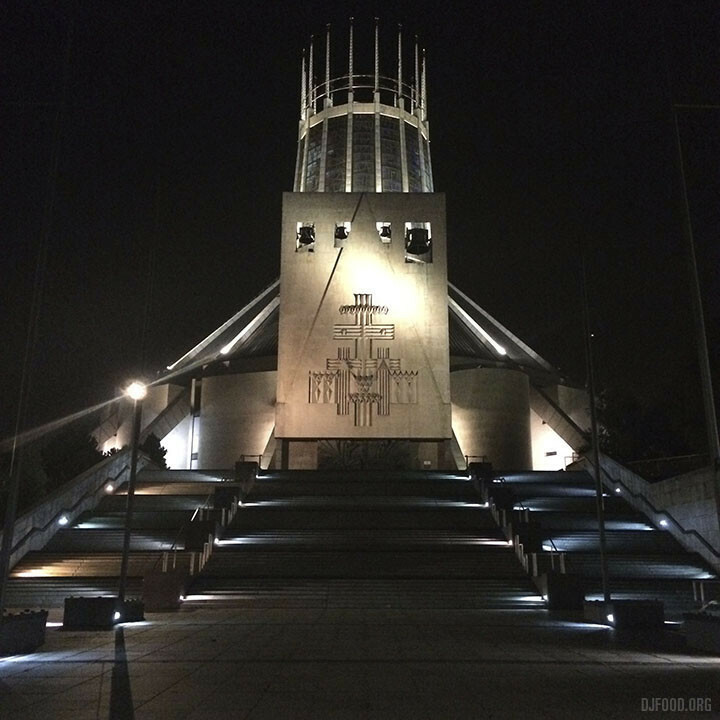 The above photo was my brief from Bill Drummond for the set I was to play at the JAM‘s Welcome To The Dark Ages event in Liverpool. 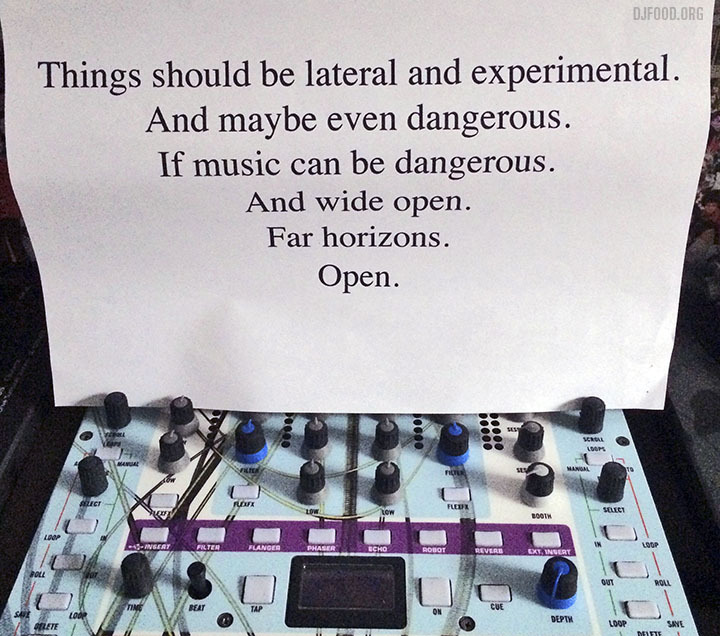 I stuck it above my mixer as I was preparing the set, it’s something to keep in mind as we go forward into 2018. 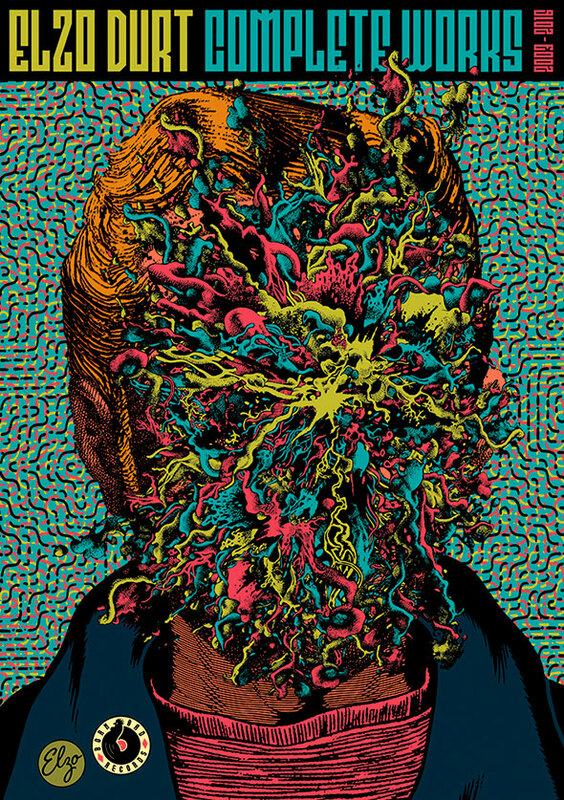 I spent most of the year in limbo, waiting in a chain for a property to come through. 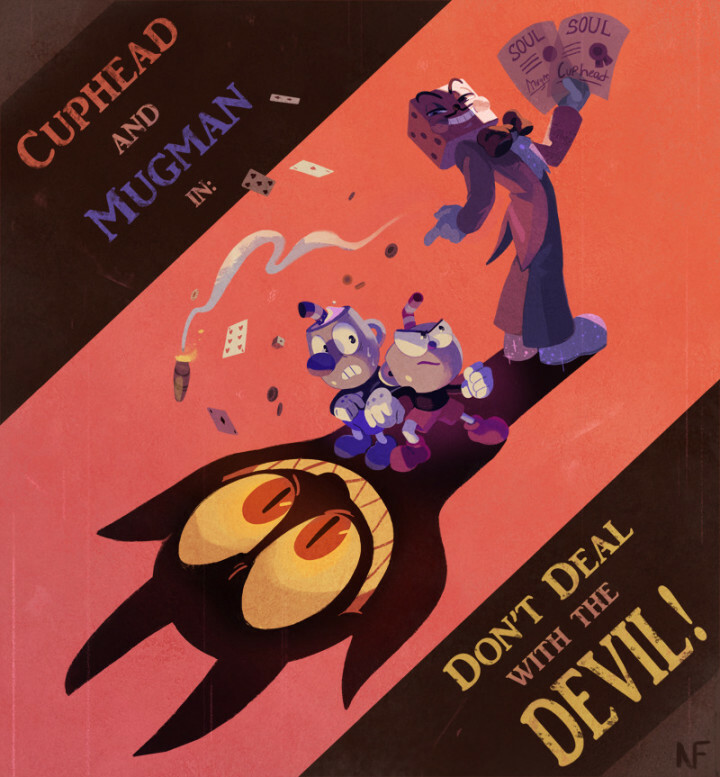 When it finally did in mid September, I pretty much ate, drank and slept it in between jobs as it needed a lot of work doing, hence no posts for the past two odd months. 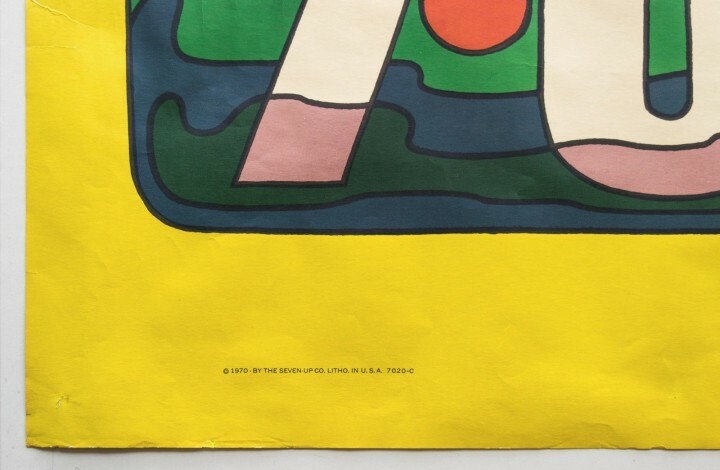 I’m in now and can see the wood for the trees but it did mean I largely dipped out of social media for the latter quarter of the year (probably not a bad thing). 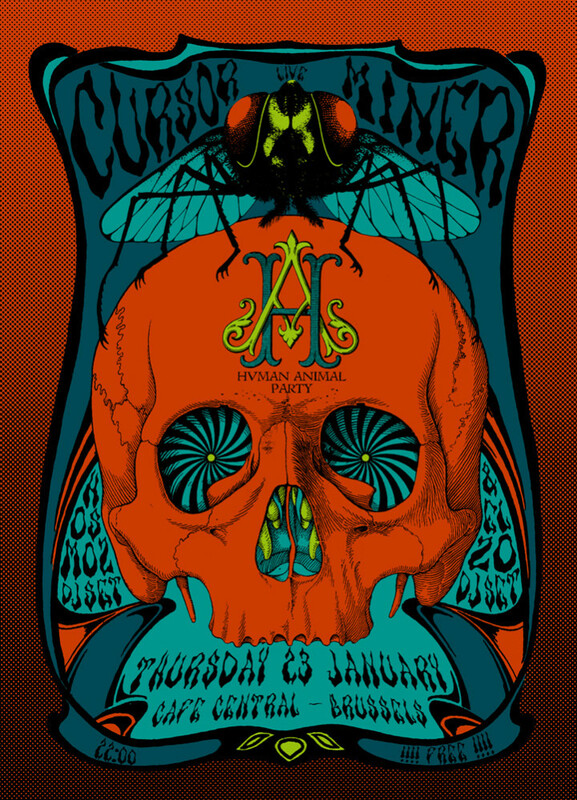 Asked to play the Justified Ancients of Mu Mu happening in Liverpool, which turned out to be one of the events of the year – who’d have thought it? 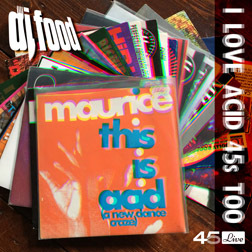 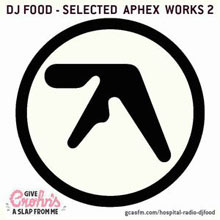 A career highlight that saw me playing many of the tracks they’d sampled in their career alongside acid house classics and ending at 3am with a version of ‘In The Ghetto’. 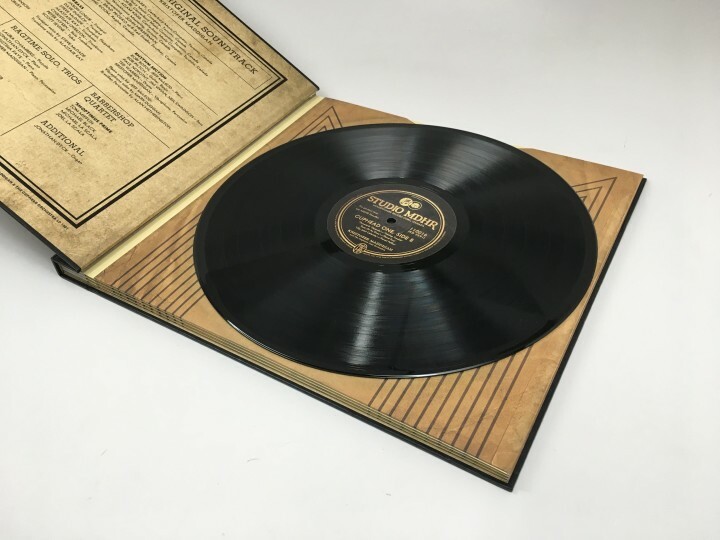 Scoring a long time wants list LP – Yves Hayat‘s ‘Conversations Between The East & The West’ – direct from the archive of the composer himself and meeting him in London to receive the record. 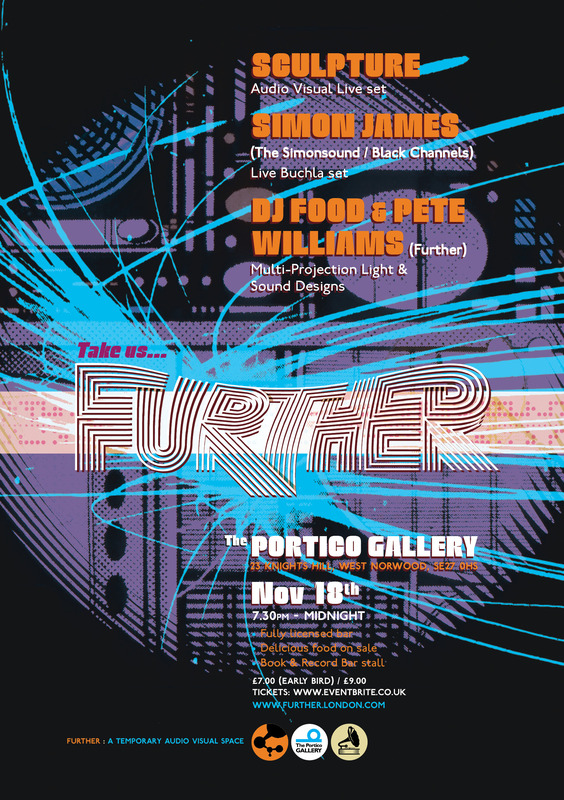 The second major Further gig at the Portico Gallery featured Simon James playing a Buchla set to bespoke visuals we made and Sculpture slaying the place with their AV act. 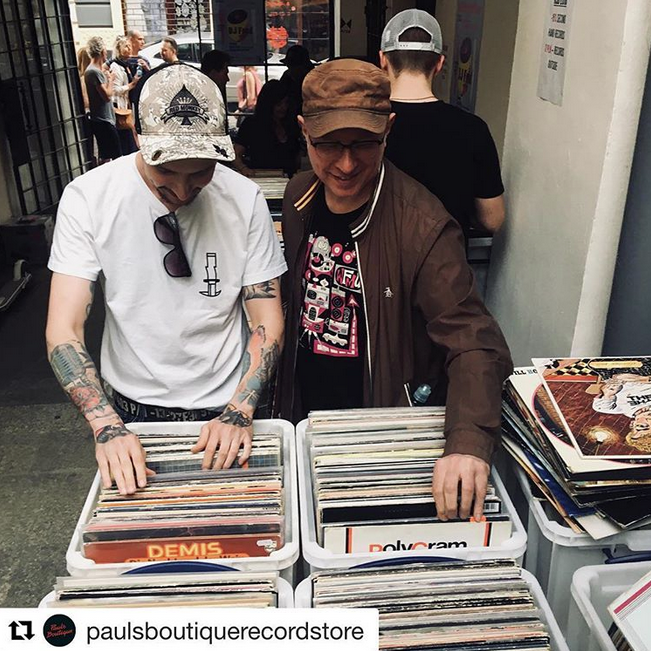 We’ll also have the Book & Record Bar stall with releases from both acts and a hand-picked selection to compliment plus delicious food and plenty of seating. 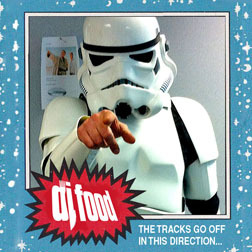 See below for what to expect on the night. 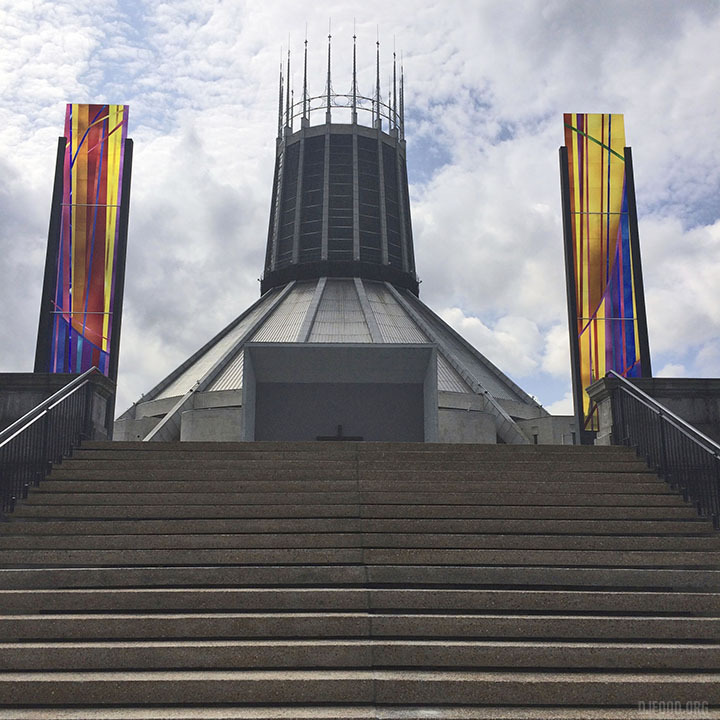 This summer, during my visit to Liverpool to attend The JAM’s ‘Welcome To The Dark Ages’ event I found some time to visit a few landmarks around Liverpool. 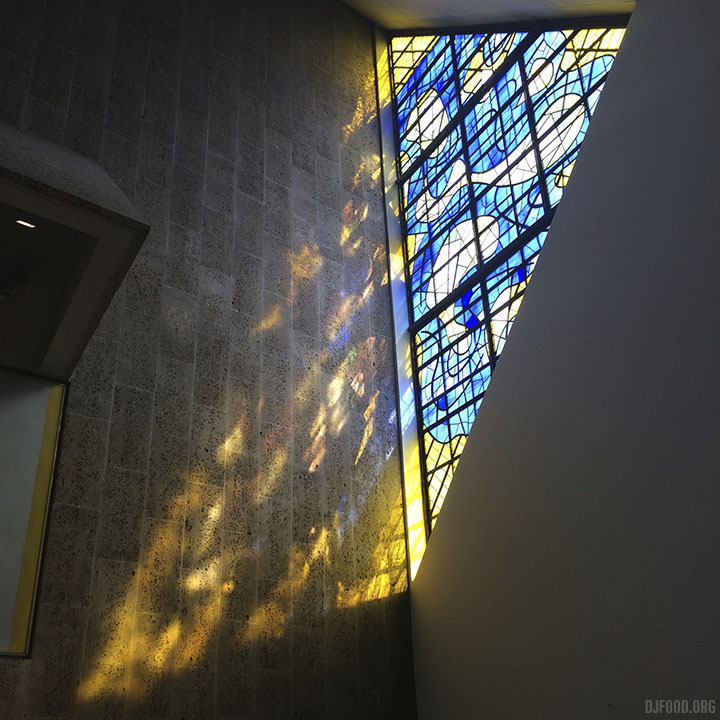 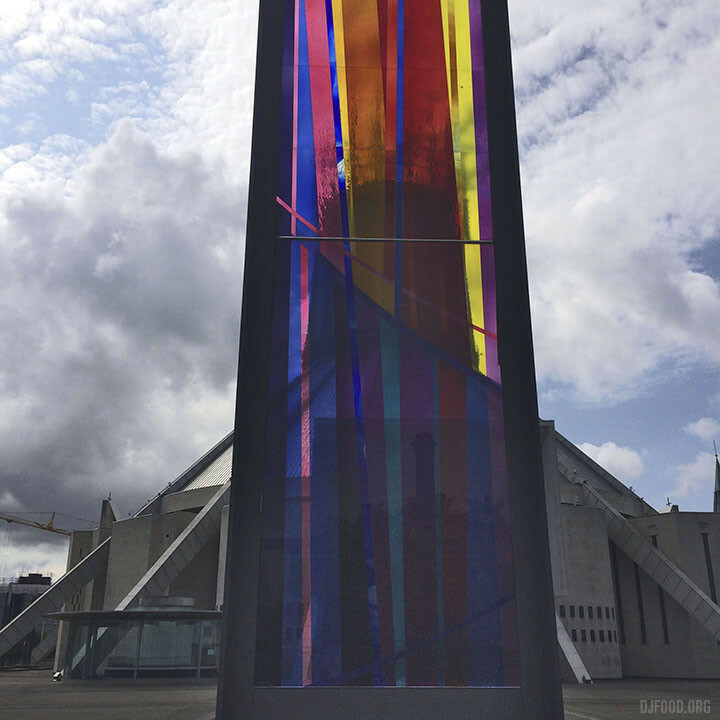 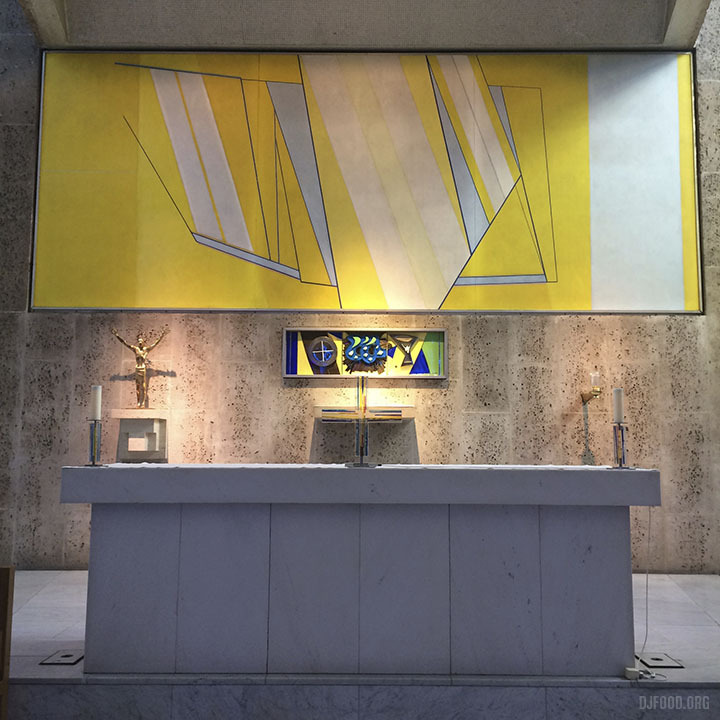 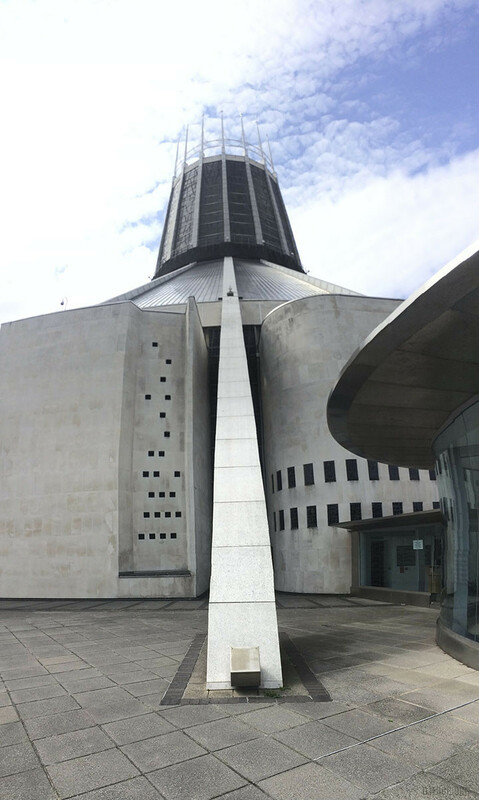 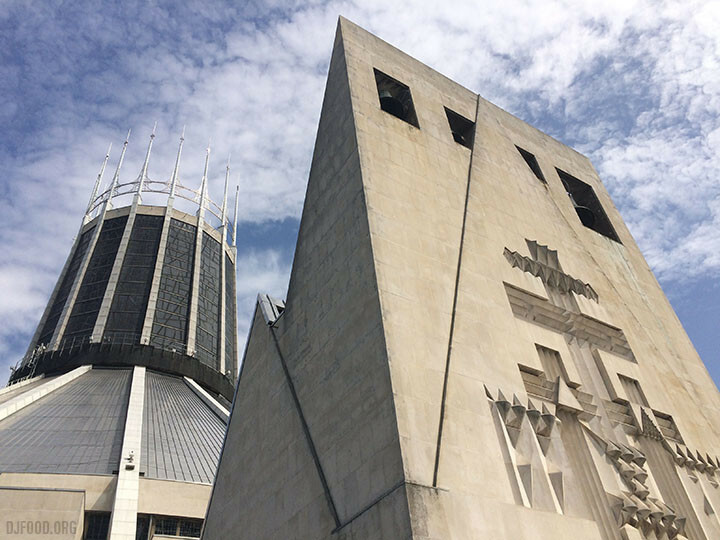 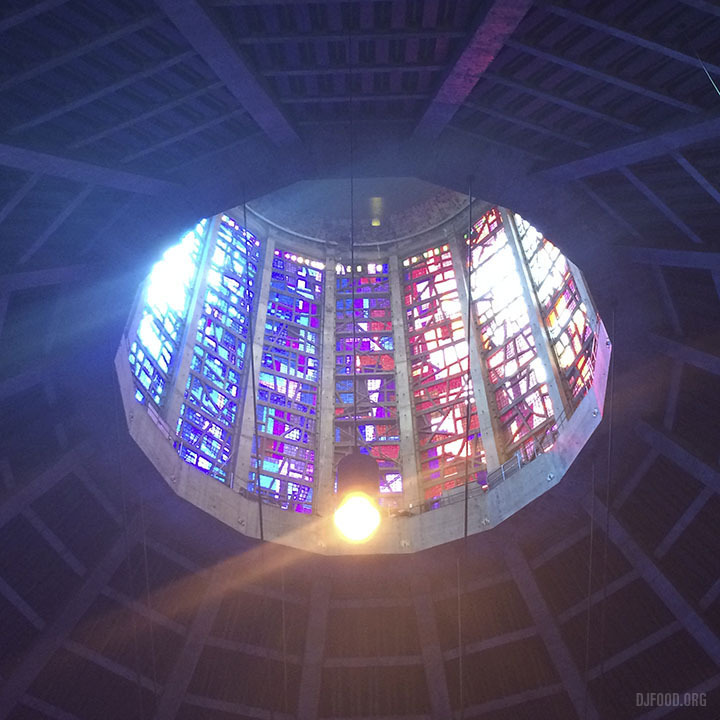 My first stop was the 50 year old Metropolitan Cathedral of Christ the King which has some of the most stunning architectural features and stained glass windows I think I’ve ever seen. 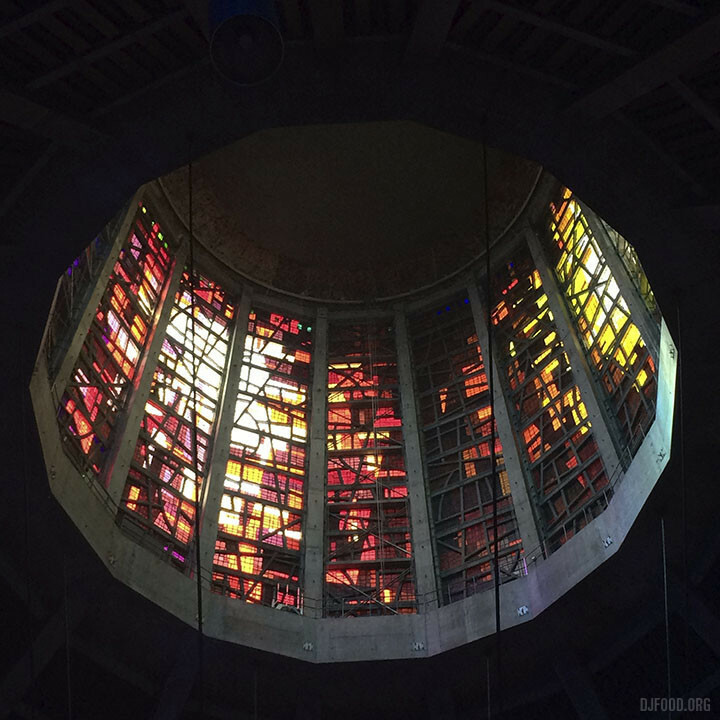 The photos speak for themselves but my camera just couldn’t capture the vividness of colour created by the sun lighting up the windows. 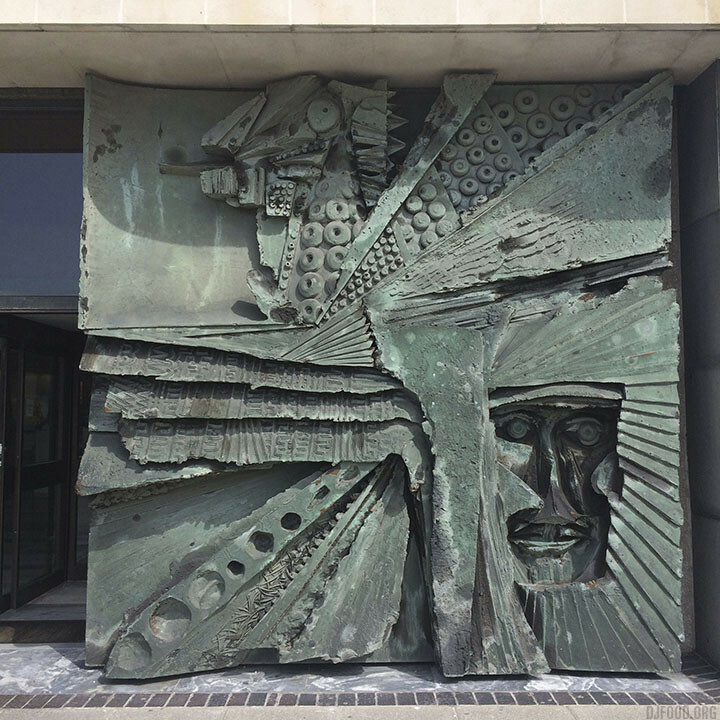 For a building half a century old it’s an incredibly modern piece of art, right down to some of the imagery and sculptures they have installed.